It was built to demonstrate the constructability of the crown; it has served well and honourably. 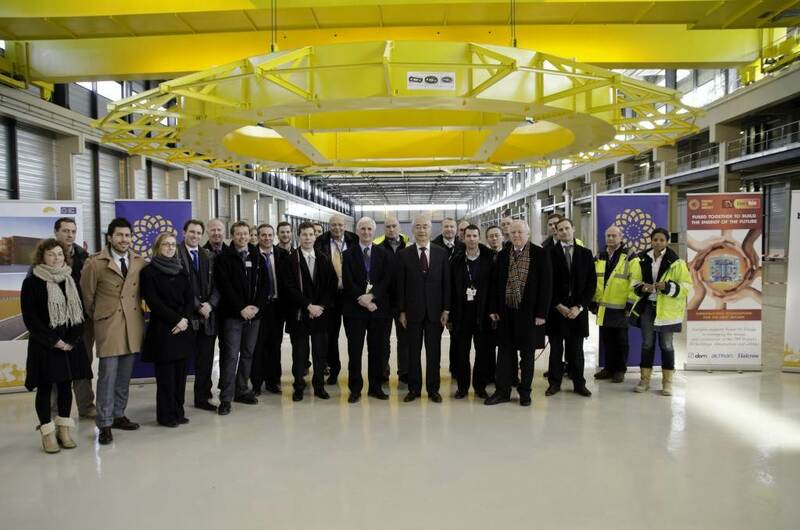 The 40-degree crown mockup on the ITER site is celebrated in a short ceremony in January. The handover of the cooling tower zone from the European Domestic Agency to the ITER Organization takes place on 21 December 2018. 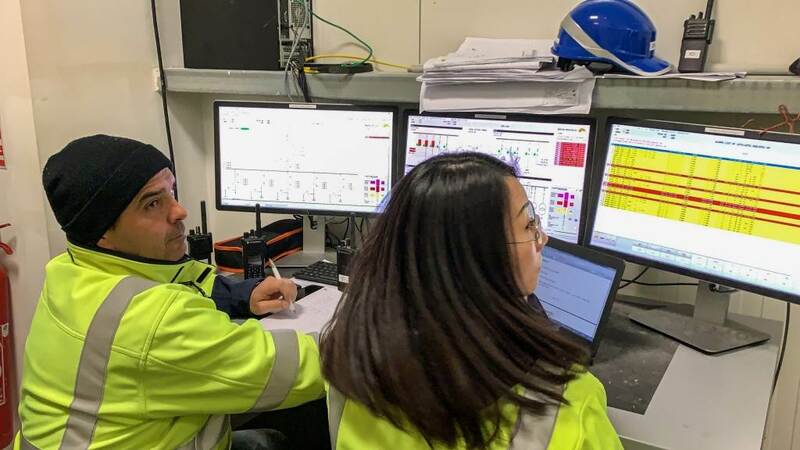 The infrastructure is ready; now the ITER team will supervise the installation of equipment sent by the Indian Domestic Agency. 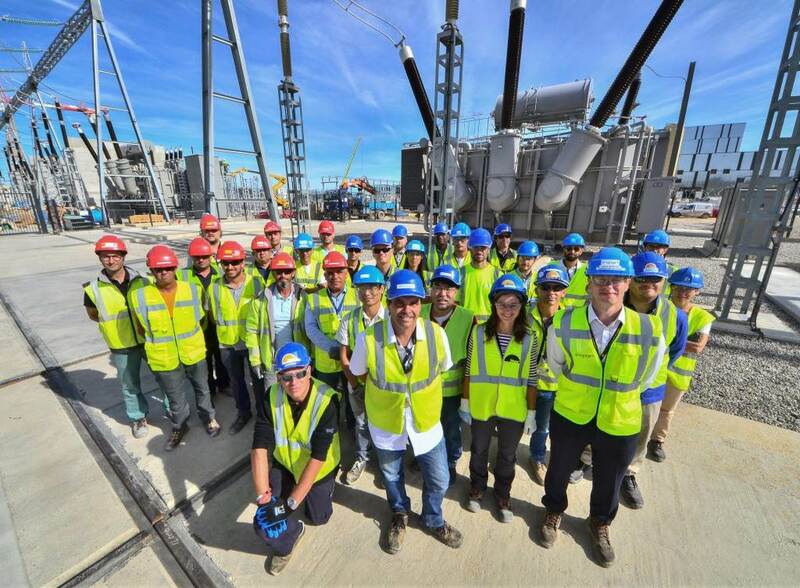 ''Electricians'' and command-control specialists from the ITER Organization and the European Domestic Agency (Fusion for Energy) succeed on 18 September in powering up the four transformers of the steady state electrical network. 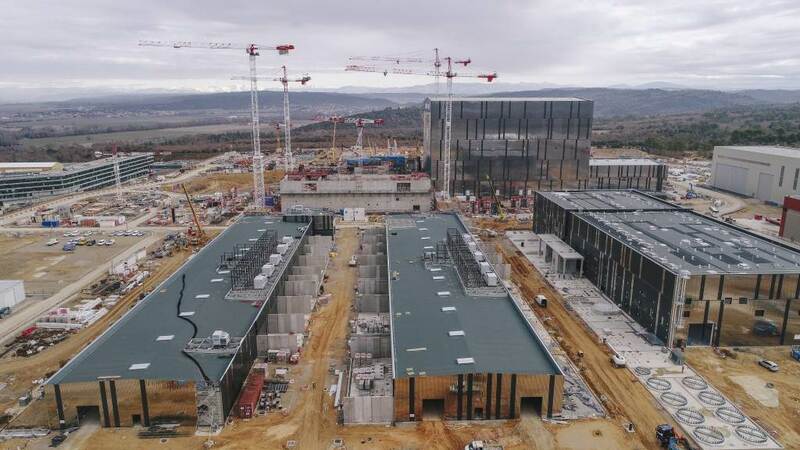 This "energization" means that ITER is now officially connected to the French grid. Last pour for circular "nest"
After two and a half years of work, European contractors realized the final pour of the bioshield—the 30-metre wall that completely surrounds the machine. The two buildings to the left of this image—the twin Magnet Power Conversion buildings—are now ready for equipment. 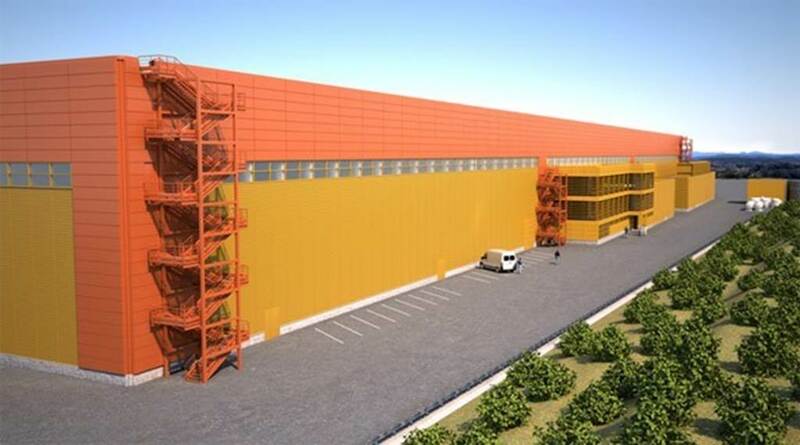 Electrical components shipped from China, Korea and Russia will be progressively installed inside of the building as well as in the exterior bays. The very first activities of the ITER assembly and installation phase kick off in early September with the start of work on the first large tool in the Assembly Hall. The components of the vacuum vessel sector sub-assembly tool (SSAT #1) were delivered in batches by the Korean Domestic Agency over the summer; now they will be progressively installed from bottom up. Pictured: metrologists take the first floor-level measurements. A "ready for equipment" milestone is achieved in the ITER Assembly Hall in late June 2017. Early access is now available for the reception of the first tooling equipment; the Cleaning Facility is available for shared use, and temporary enclosures are in place to allow work to continue in other areas of the building. In an important milestone on site, the first equipment is installed in the 5,400 m² ITER cryoplant in late June 2017. 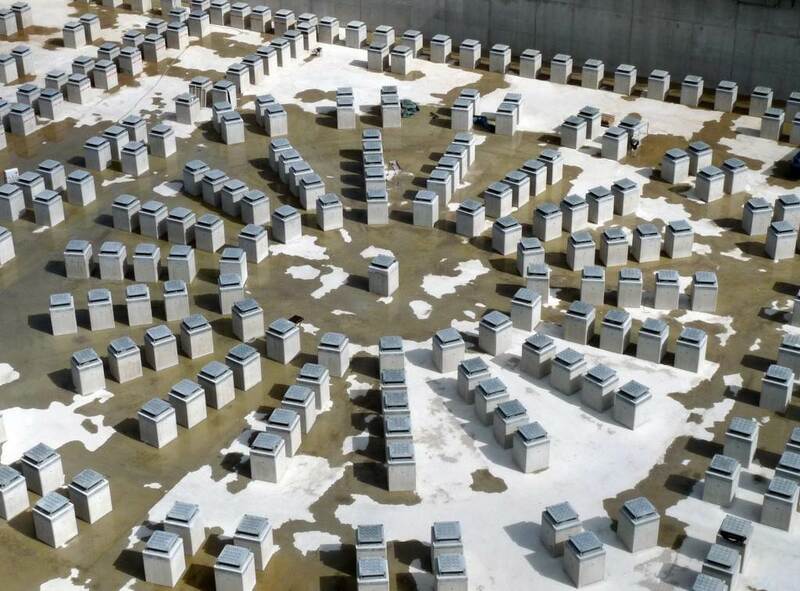 Three helium cold boxes (large refrigerators designed to cool gaseous helium to the ultra-low temperature of 4.5 K) have now been installed on their permanent footings. 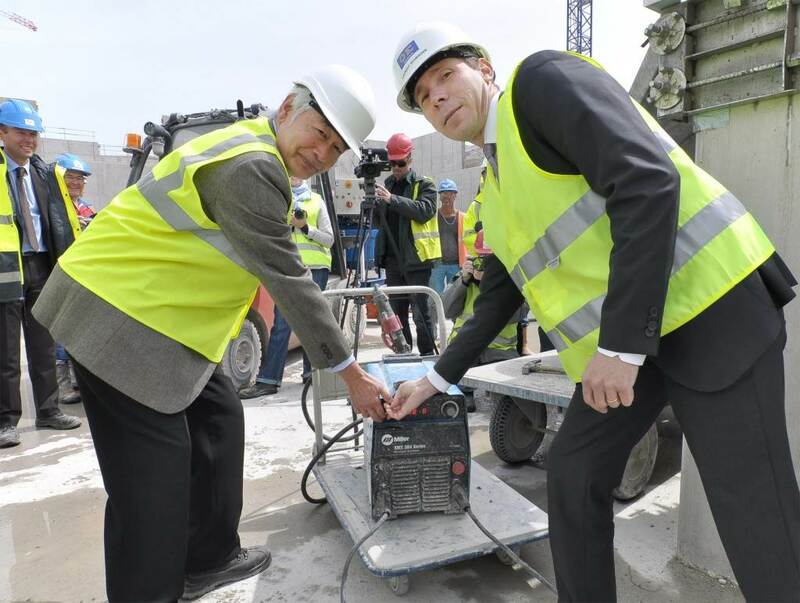 In close coordination with the French transmission system operator RTE, the 400 kV switchyard is successfully powered up in March. 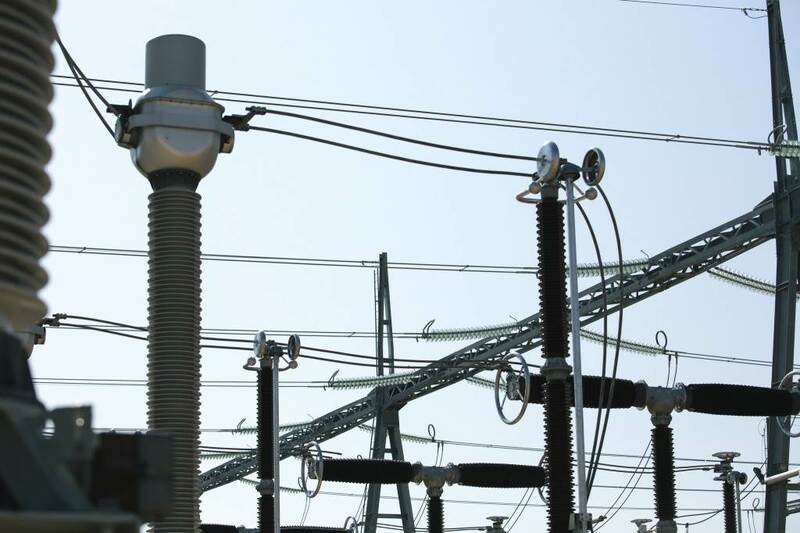 The power will supply the 22 kV network on site and--later--the 66 kV network. 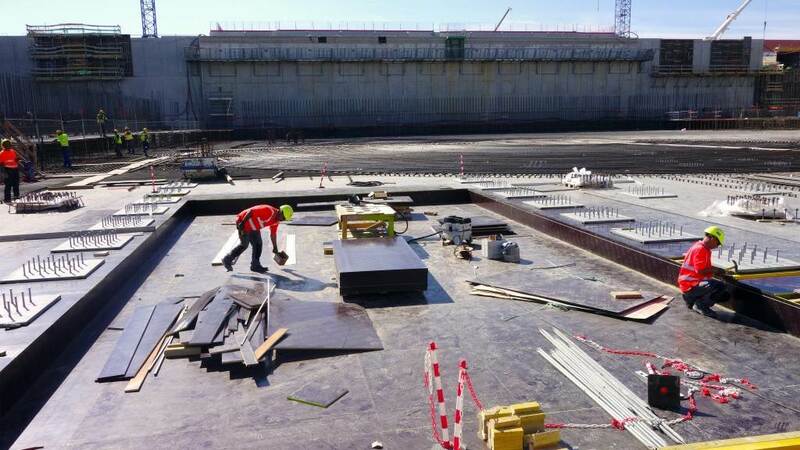 Work is progressing rapidly on the ITER bioshield: late March, workers get started on the third above-ground level (L3). In the picture, the L1 level is fully poured, the L2 level is half poured and work is beginning on the L3 level. 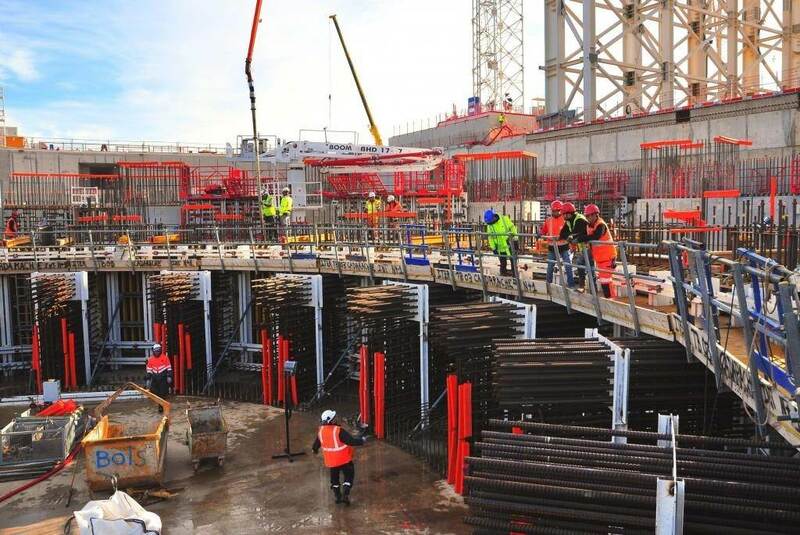 Since 2010, the Tokamak Complex construction project has been evolving below the level of the platform—excavation works first, followed by the creation of the building's seismic foundations and the realization of basement levels B2 and B1. But that was then. Now, with the Diagnostics Building (pictured) and the bioshield (hidden) completely framed out at L1 level, the view is changing considerably. 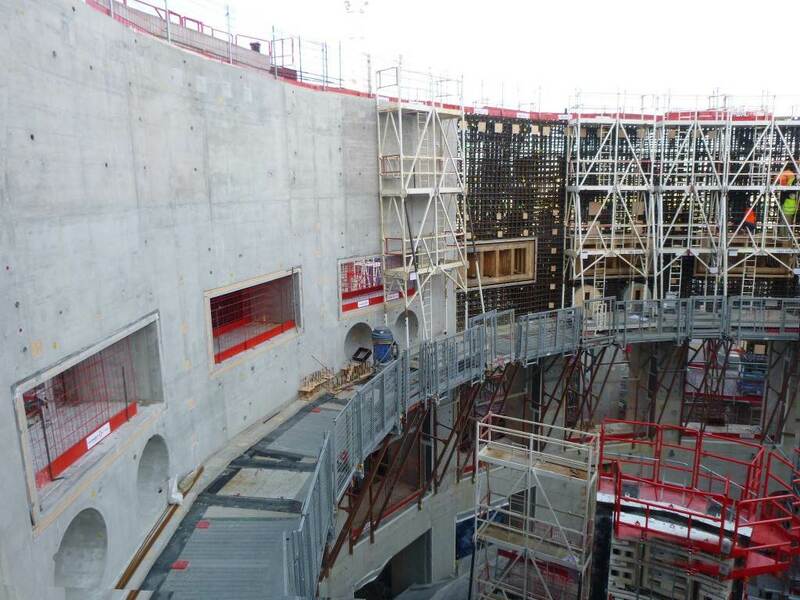 Work gets off to a start on the L2 level of the ITER bioshield in October 2016 (see the scaffolding and formwork on the top of the L1 ring). 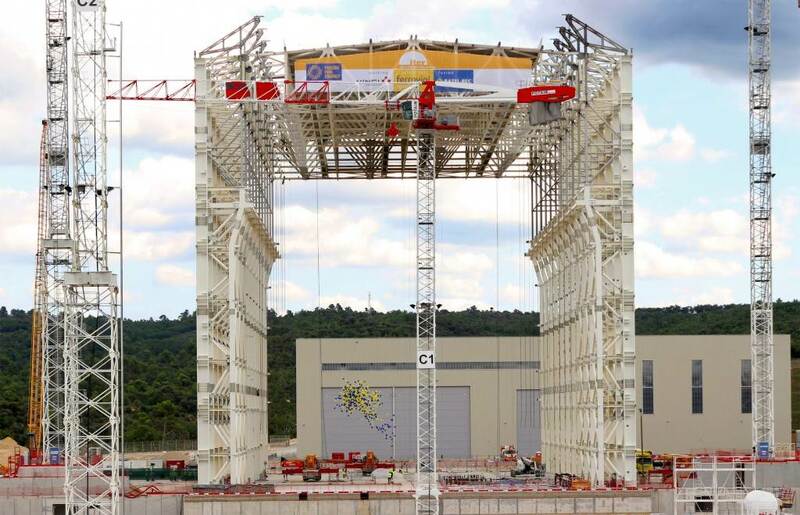 Meeting an ITER Project Milestone on time, European contractors install the main cranes of the Assembly Hall in June 2016. These two travelling cranes will, together, carry loads of up to 1,500 tonnes from the Assembly Hall to the Tokamak installation area. 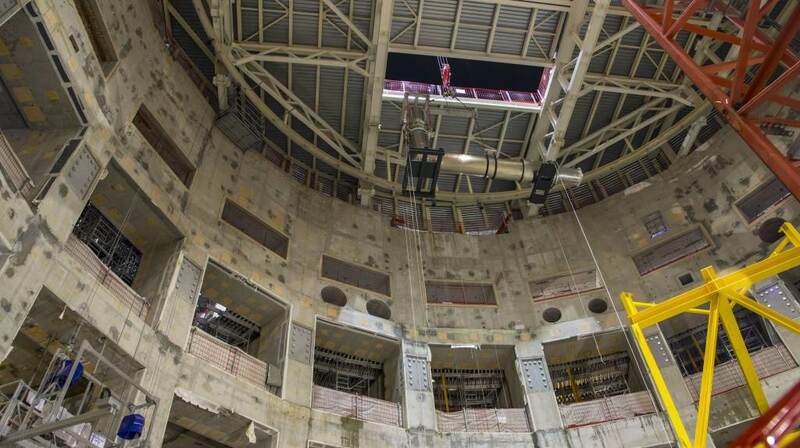 This 18m³ tank is the first mechanical equipment to be lowered into the Tokamak Building. 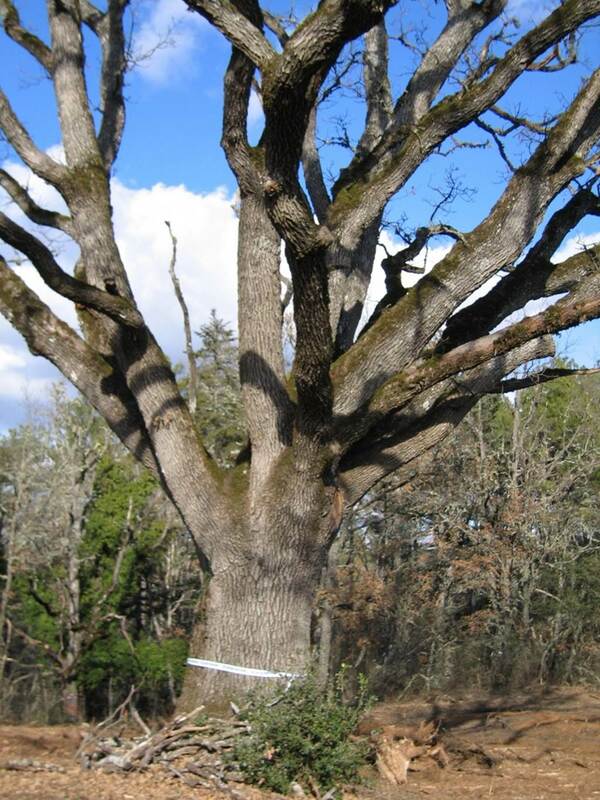 Procured by Europe, it is part of the nuclear effluent drainage system. 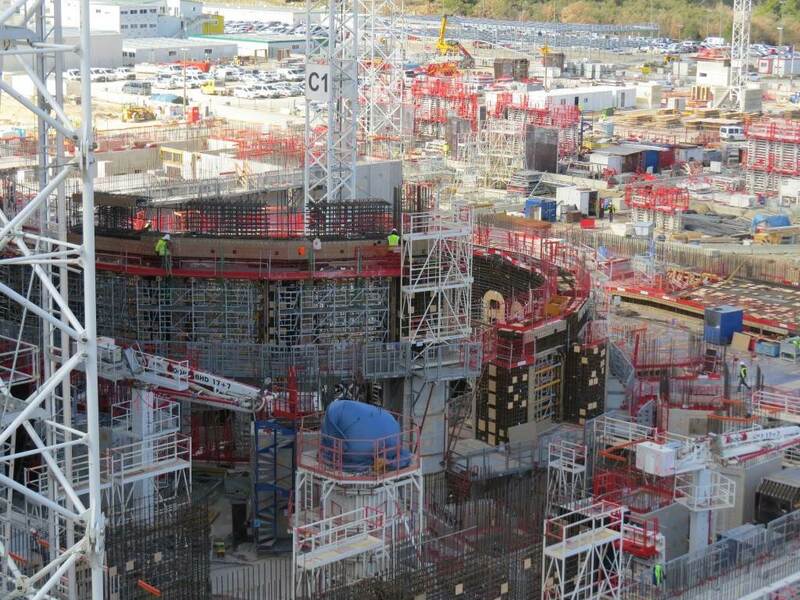 Pouring begins on Tuesday 26 April for the B1-level basemat of the Tokamak Building, in respect of the 2016-2017 project schedule approved by the ITER Council. 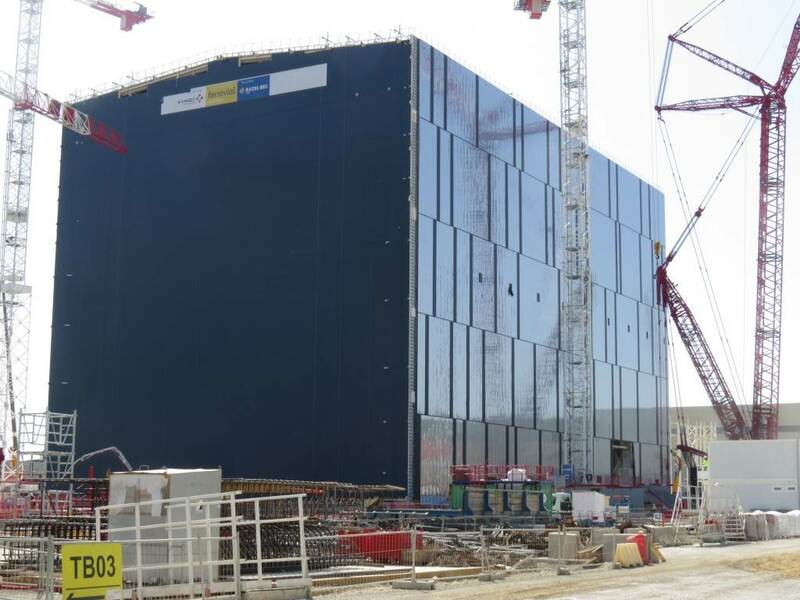 On Tuesday 29 March, a water detritiation tank supplied by Europe becomes the first plant component to be installed in the Tokamak Complex. Five other tanks will be installed in the coming weeks in the lowest level (B2) of the Tritium Plant, in accordance with schedule milestones. 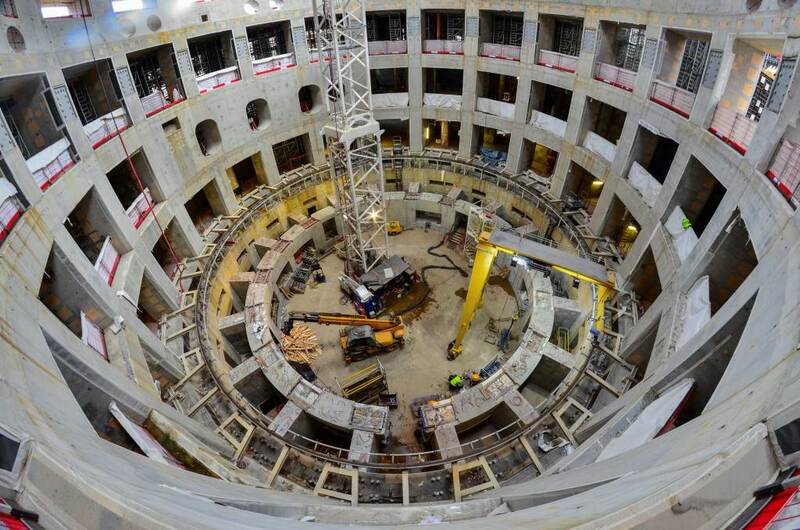 Pouring begins on 6 January 2016 for the first basement level of the Tokamak Complex (B1). In the area of the Diagnostic Building (pictured) it will take only four months to complete the interior and exterior B1 walls and to start on Level L1 (ground level). In the early hours of Wednesday, 21 October, workers poured the first 200° segment of the bioshield, in an all-day operation that took some 15 hours to complete. The roof structure of the Assembly Hall (730 metric tons) is successfully lifted into place in a 14-hour operation on 10-11 September 2015. 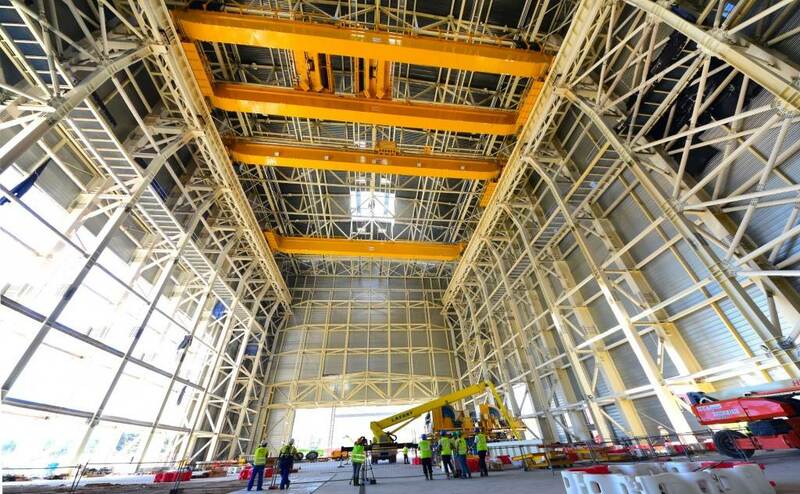 Next to come will be cladding activities and the installation of rails for the heavy-lift cranes. 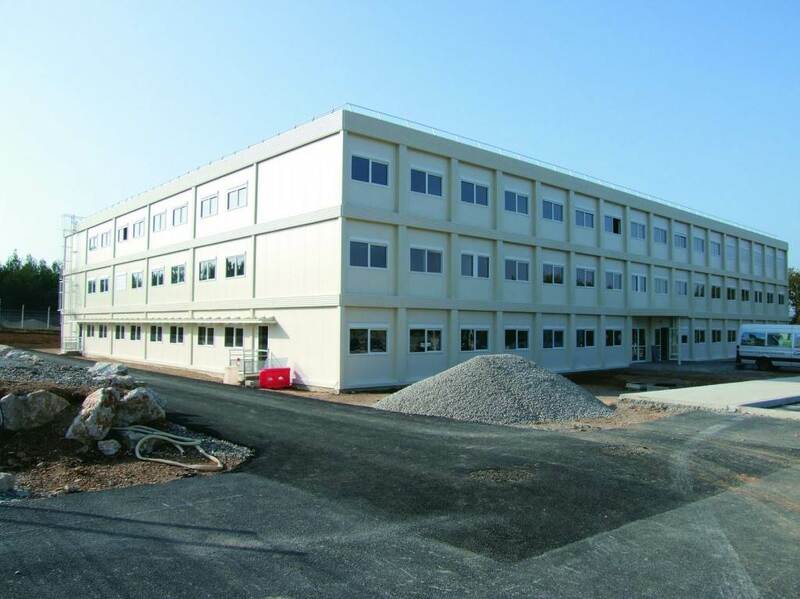 The largest ITER warehouse is completed on time and within budget in September 2015. 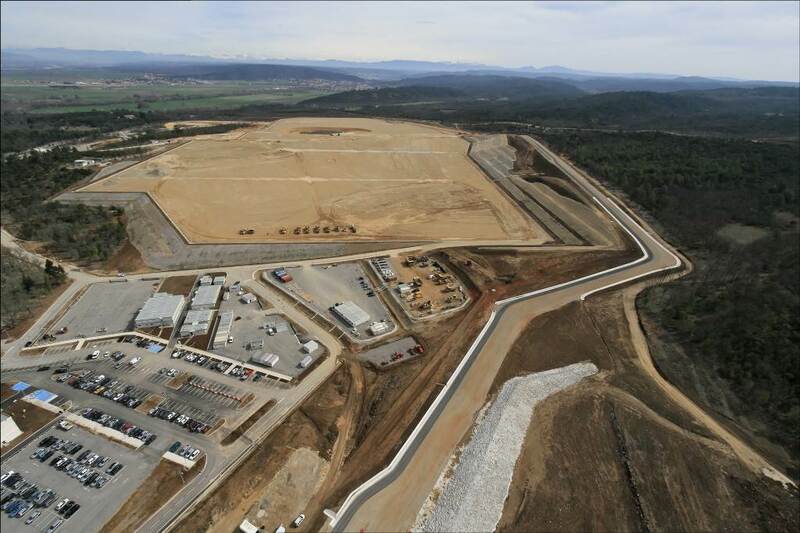 This 10,000 m² facility behind the ITER platform (160 metres long, 60 metres wide, 12 metres high) will be used to store components arriving from the ITER Domestic Agencies. In July 2015, the first formwork for the next basement level (B1) was set into place for the Diagnostics Building. 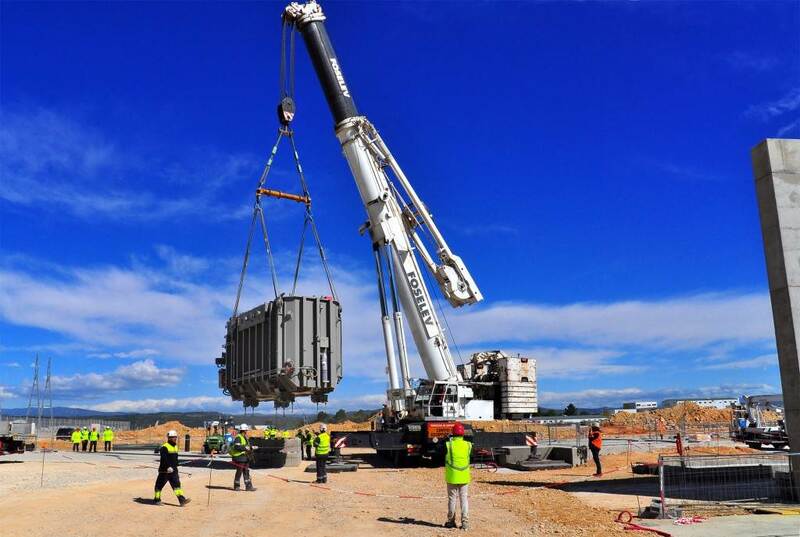 The ITER Project celebrates a construction milestone on 21 May 2015 as the first plant component—an electrical transformer—is installed in its permanent position on site. 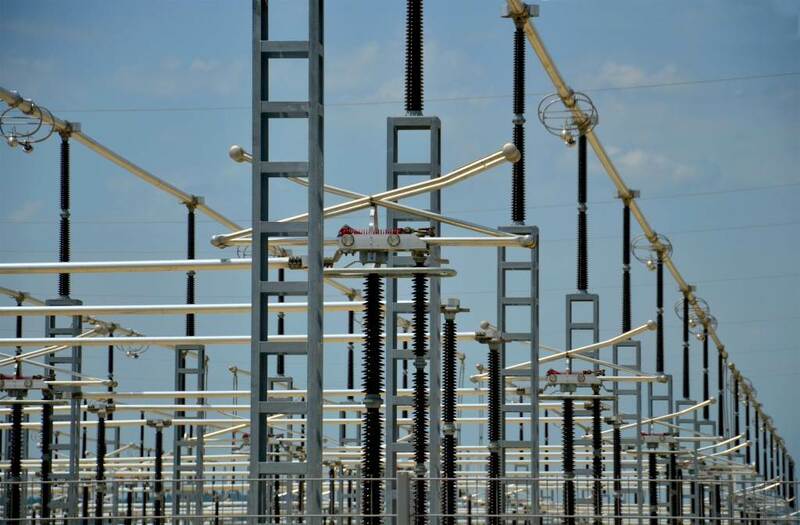 Procured by the US and manufactured in Korea by Hyundai Heavy Industries (HHI), this transformer—and three others like it—will connect the 400 kV grid to the AC electrical distribution system. 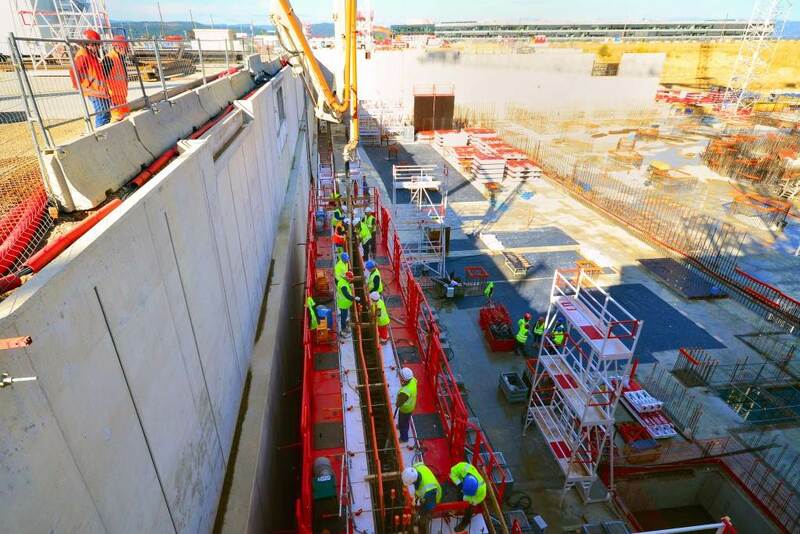 The first section of the basement-level wall of the Tokamak Complex (16 metres long, 5.5 metres high and 60 centimetre thick) was poured on 20 November 2014 for the Diagnostic Building. Some 50 m3 of concrete were poured in successive 50-centimetre layers to allow for vibrating operations. 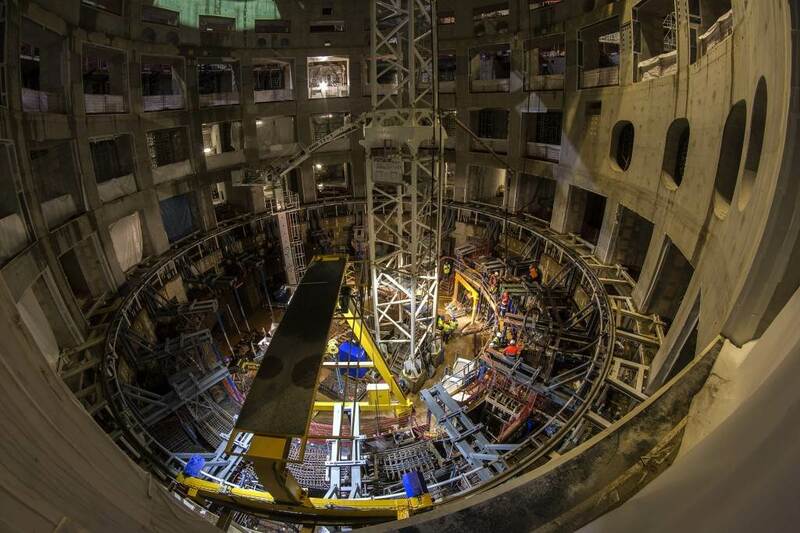 On 27 August 2014, the fifteenth and final segment of the Tokamak Complex basemat is poured. 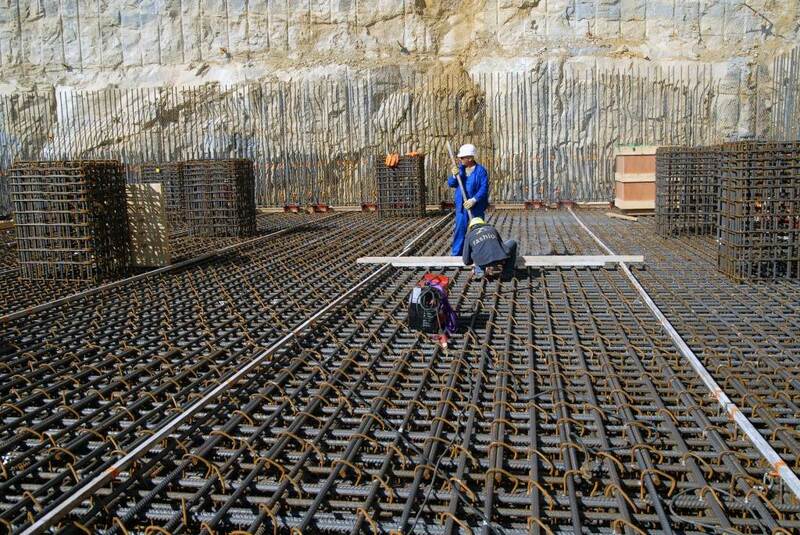 The finalization of the 9,300 m² slab (14,000 m³ of concrete, 3,600 tonnes of rebar. 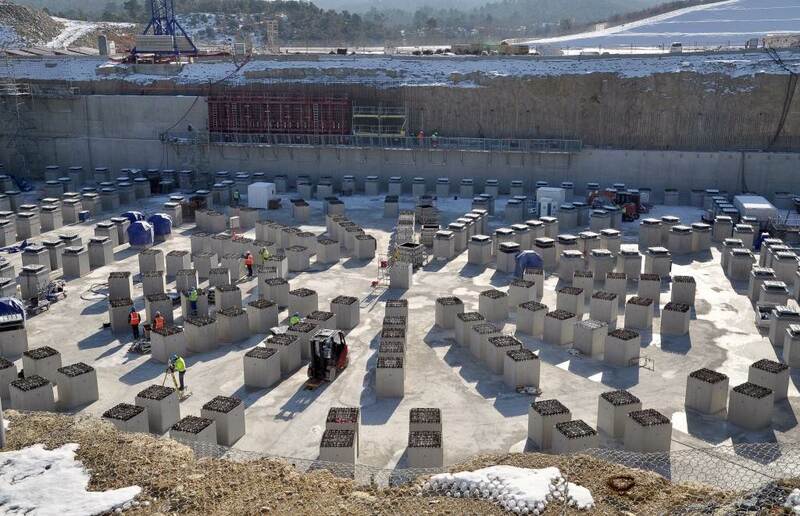 2,500 embedded plates) is the last phase of Tokamak Complex foundation work. Work can now begin on the walls of the buildings. 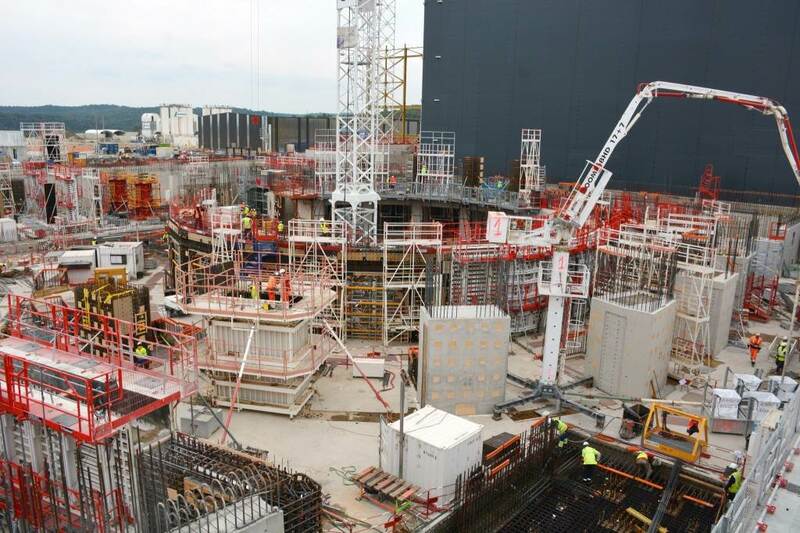 On 10 July 2014 pouring begins on the central part of the Tokamak Complex basemat slab—the most technically complex part of the slab that will directly support the 23,000-tonne machine. The central area, which will be poured in nine segments, should be completed in August. For the time being it's the tallest building on the ITER Platform! Construction on the Cryostat Workshop (in grey) ends in April 2014 following the installation of the 18-metre-tall gantry crane for heavy loads. 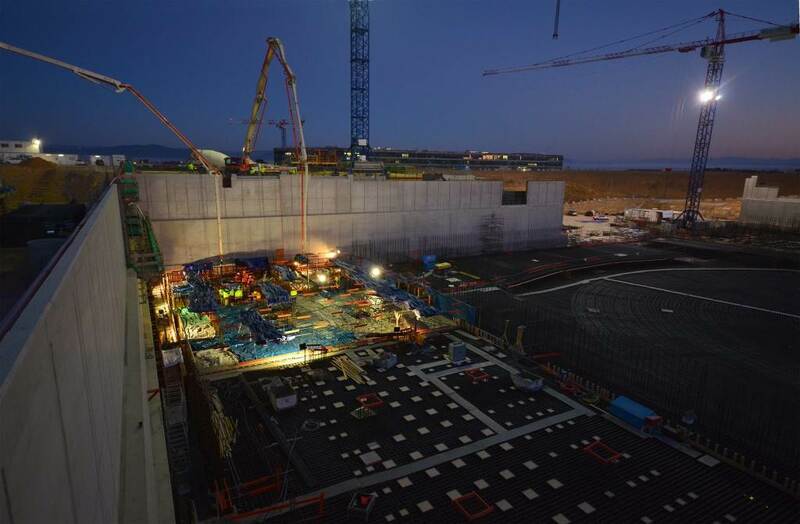 On the morning of 11 December, concrete pouring begins for the basemat of the Tokamak Complex. 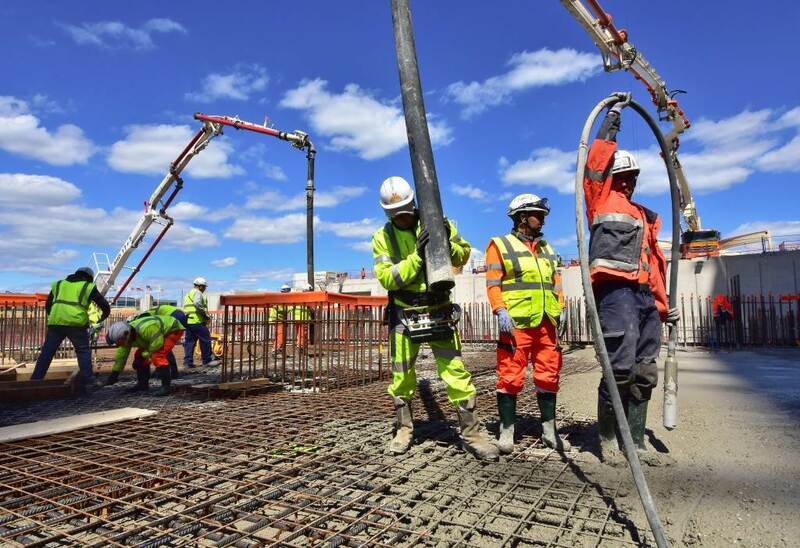 Six months, and another 14 "pour days" will be necessary to complete the 1.5-metre-thick slab that will support the weight of the Tokamak, Diagnostic and Tritium buildings. 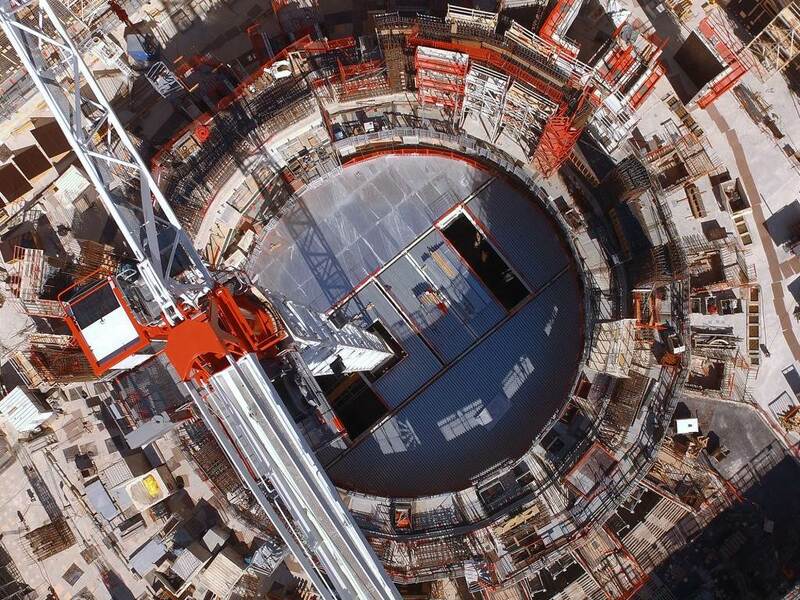 In October 2013, the European Domestic Agency for ITER concludes a EUR 530 million contract for Tokamak Complex building services with a Franco-German consortium comprising Cofely Axima, Cofely Ineo and Cofely Endel (part of the GDF Suez Group) and the M +W Group GmbH. 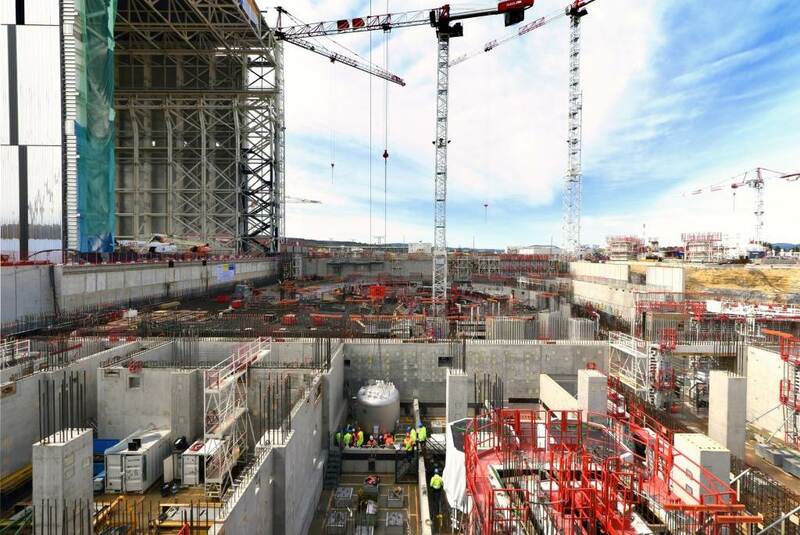 The contract (called TB04) covers the design, supply, installation and commissioning of the mechanical and electrical equipment for the Tokamak Complex plus the surrounding buildings—a total volume of 97,200 m3. 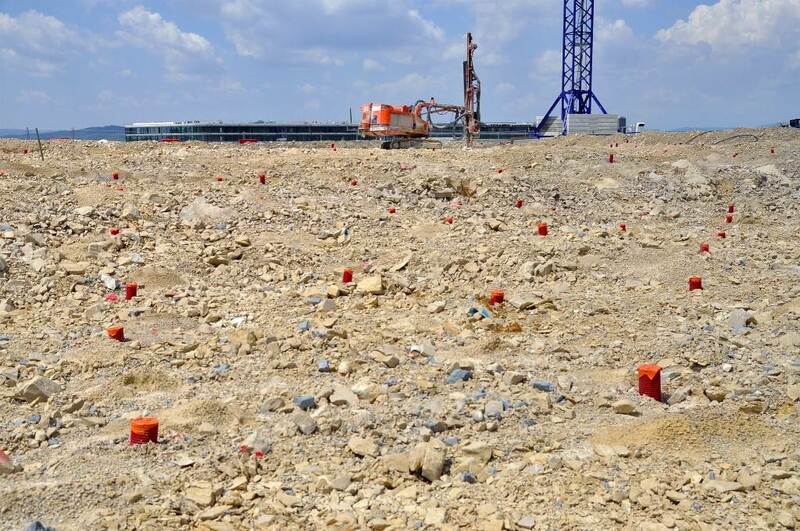 The last area of the Seismic Pit is covered on 29 August 2013; the 493 seismic pads are now completely hidden from view. Concrete pouring begins in September. 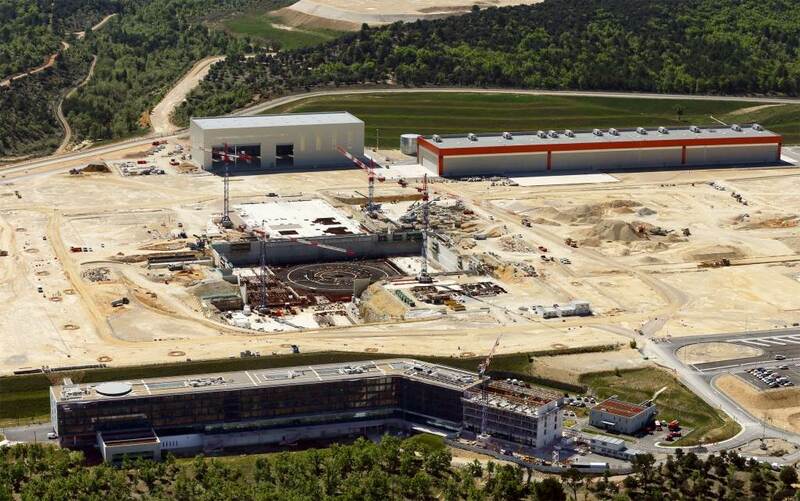 The kick-off meeting for the TB03 contract was held on 30 April 2013—this EUR 300 million package covering the construction of the main Tokamak Complex and auxiliary buildings was signed in December 2012 by the European Domestic Agency with the Franco-Spanish consortium VFR. 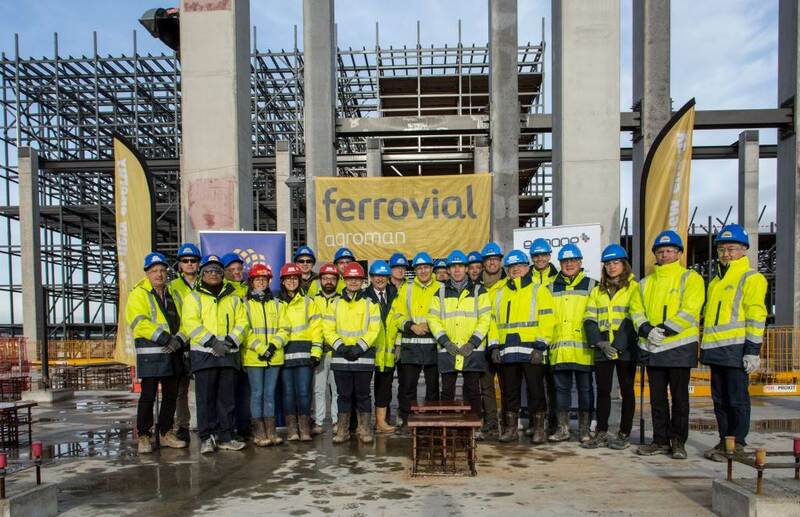 The VFR consortium brings together VINCI Construction Grands Projets, Razel-Bec, Dodin Campenon Bernard, Campenon Bernard Sud-Est, GTM Sud and Chantiers Modernes Sud as well as the Spanish company Ferrovial Agroman. 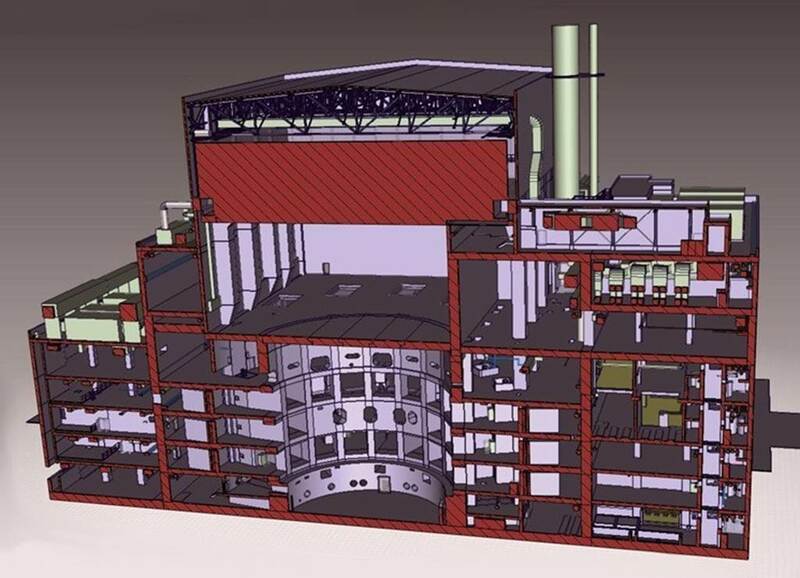 A small part of the ITER site—the approximate size of a football field (50 x 120 m)—has been made available to the Indian Domestic Agency for its temporary Cryostat Workshop, where the four main sections of the cryostat will be assembled from 54 smaller segments manufactured by India. 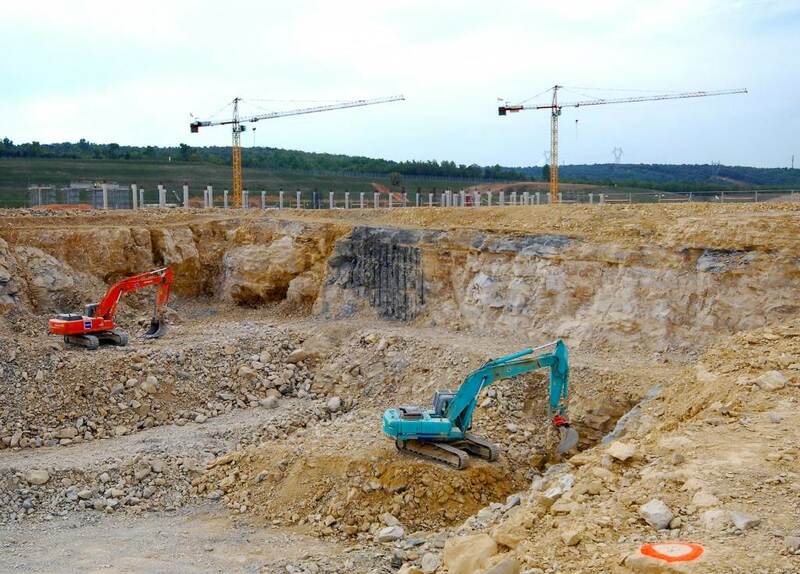 Acting as building owner on this portion of the ITER worksite, the Indian Domestic Agency will observe French labour laws and regulations. 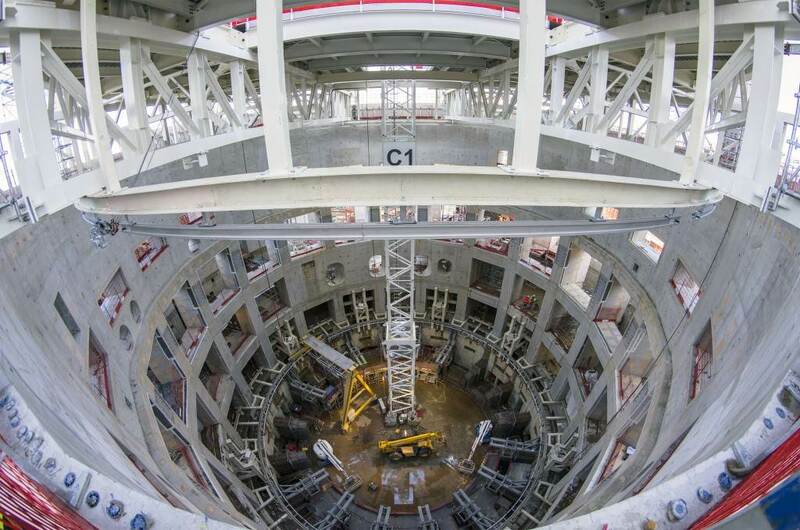 Work on the basemat of the Tokamak Complex—the 1.5 metre-thick B2 slab—begins on 27 February 2013. 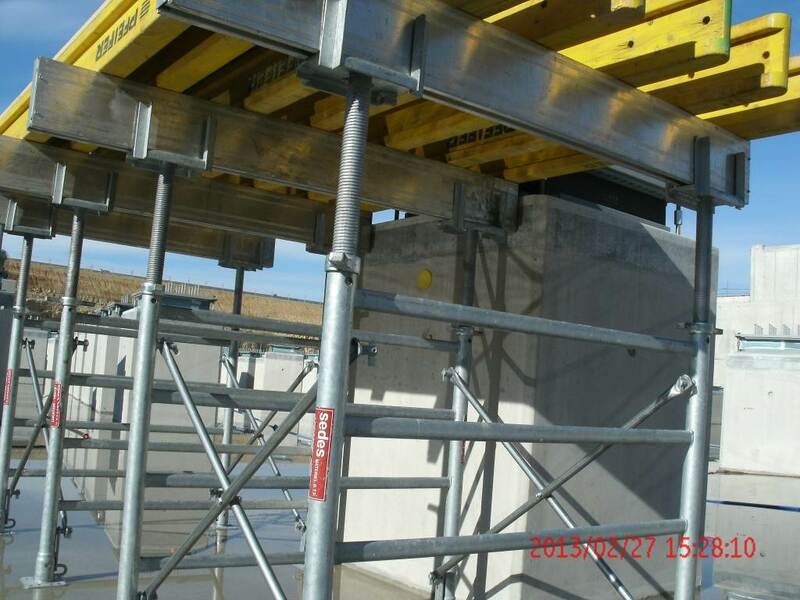 In order to pour the concrete level with the top of the seismic pads, propping and formwork must be installed around every seismic column, a phase of work that will last for four months. 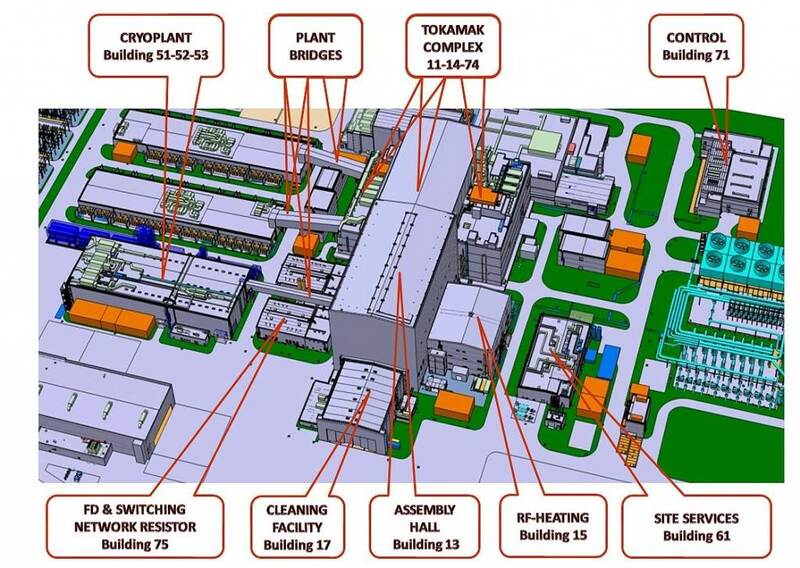 The contract for the construction of the Tokamak Complex and accessory buildings (called the TB03 contract) is signed by the European Domestic Agency with the French-Spanish consortium, VFR, in late December 2012. 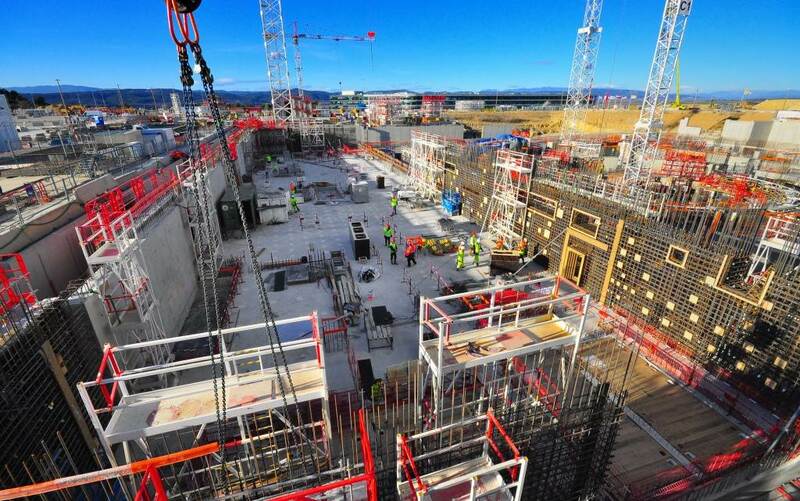 The EUR 300 million, 5.5-year contract covers the construction of the three Tokamak Complex buildings (Tokamak, Diagnostic and Tritium) plus the neighbouring Assembly Building and several site service and control buildings. 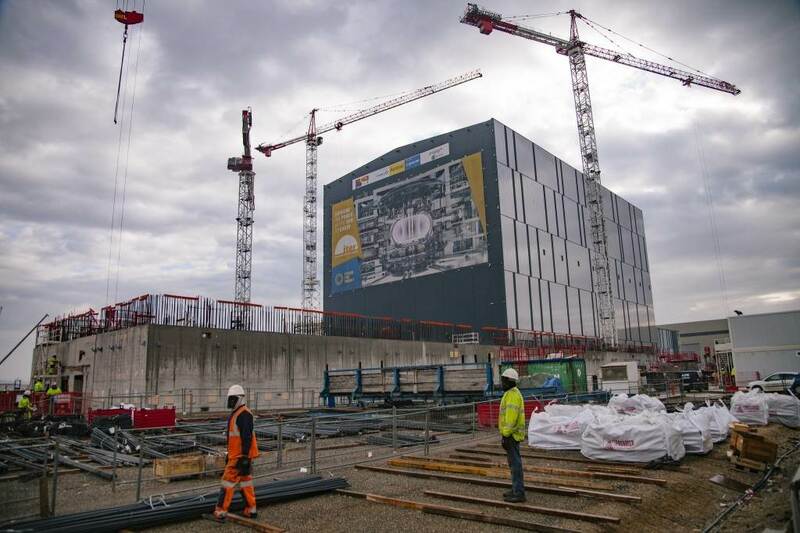 This is the largest contract signed by the European Domestic Agency to date and signifies that the pace of construction on the ITER platform is going to intensify. 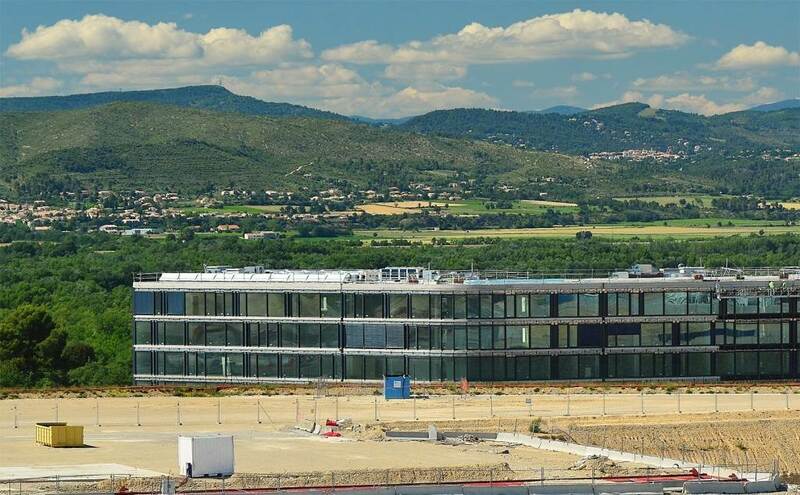 The six-story, 20,500-square-metre ITER Headquarters building is officially handed over to the ITER Organization on 5 October 2012 by Agence Iter France, under delegation from the European Domestic Agency Fusion for Energy, signalling the end of 24 months of construction work. 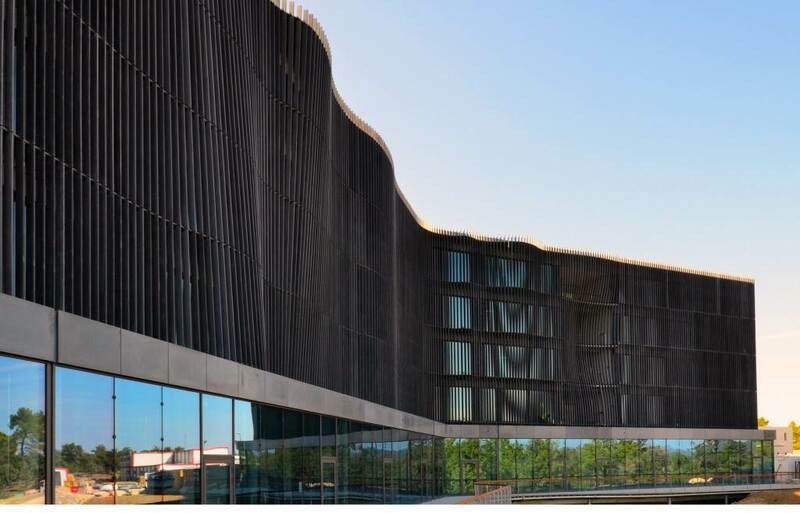 The new seat of the ITER Organization, designed by local architects Ricciotti and Bonhomme, is officially handed over by Agence Iter France (under delegation from the European Domestic Agency F4E) on 5 October 2012 after two years of construction. Work on the underground drainage networks begins in March 2012. Some 50,000 cubic metres of earth are displaced to create a network of concrete piping 8-11 metres under the surface of the platform that will evacuate rainwater. 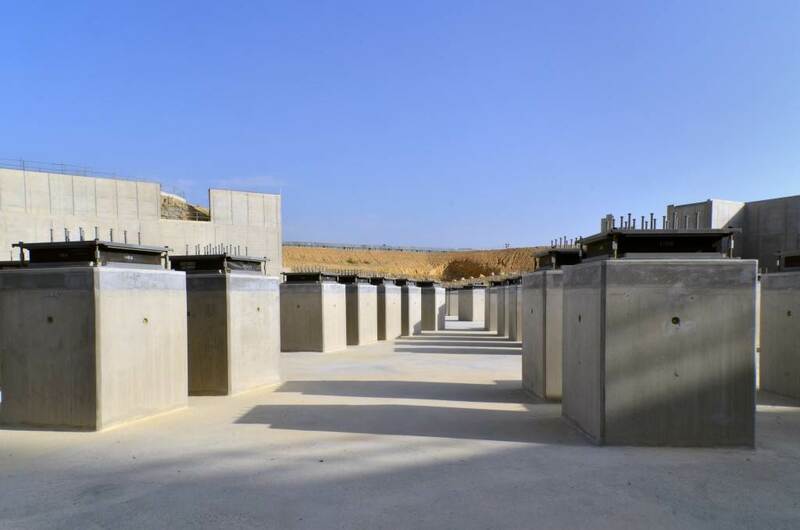 After three years of technical studies and consultation and one year of construction, the realization of the four-hectare ITER switchyard is completed on 27 June 2012. 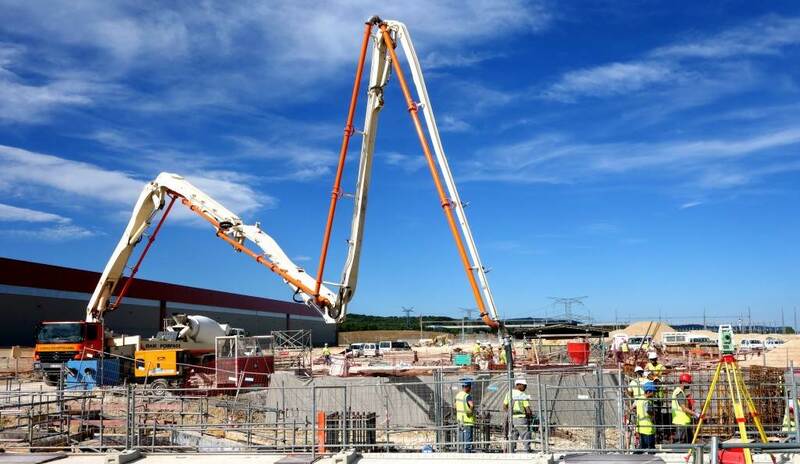 ITER is now connected to the double "Boutre-Tavel" 400 kV power lines that supply electrical current to a vast area of south-eastern France. 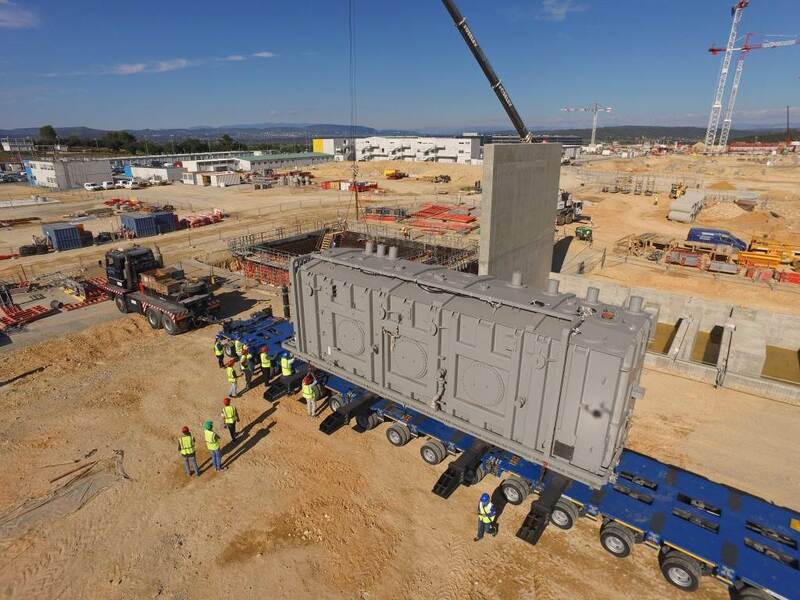 Installing and financing (EUR 22 million) the ITER switchyard and power-line extension was part of France's commitment to ITER. Work begins in May 2012 on the groundwork for the future Assembly Building. In this vast hall adjacent to the Tokamak Building, pre-assembly operations on the ITER components will be carried out prior to their installation in the machine. 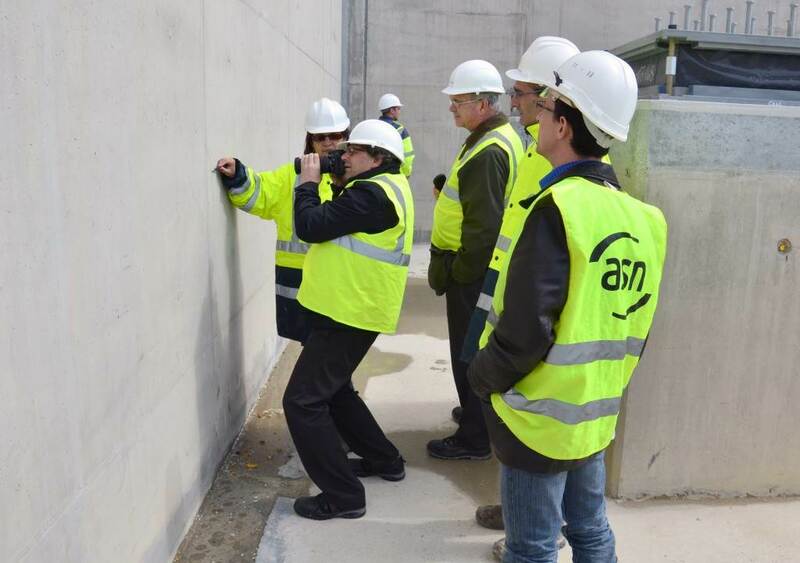 On 24 April 2012, for the third time in ten months, the French Nuclear Safety Authority (ASN) dispatches a group of inspectors to ITER. 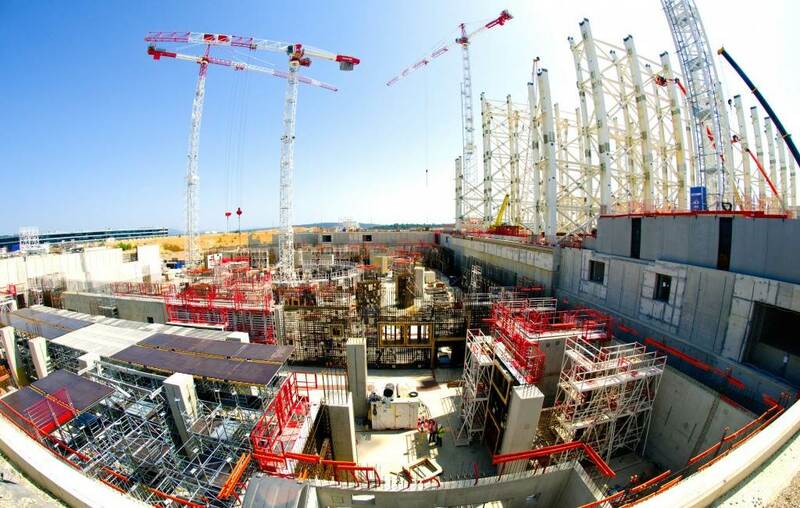 Regular inspections of ITER's nuclear installation are implemented within the framework of the ITER Headquarters Agreement, which was signed on 7 November 2007 by the ITER Organization and France. 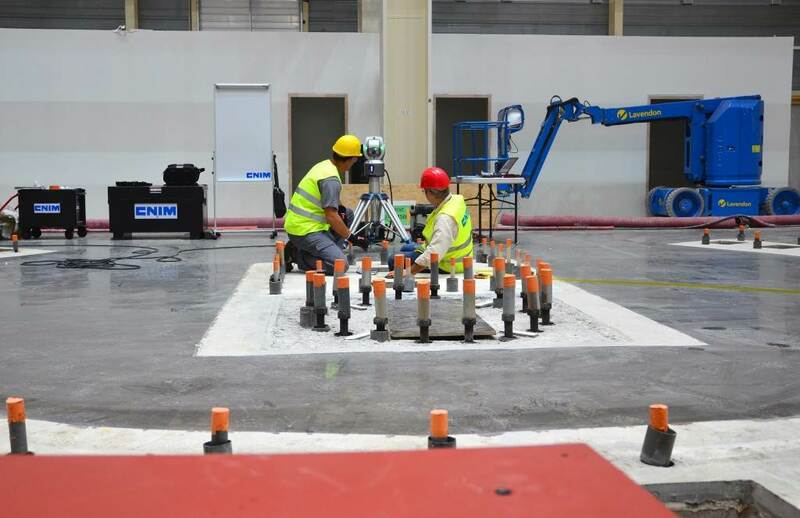 Seventeen metres below the surface of the platform, the concrete basemat, retaining walls, and seismic pads of the Seismic Isolation Pit are in place to protect the buildings and the equipment from ground motion in the case of a earthquake. On Wednesday, 18 April 2012 the 493rd—and final—seismic pad is installed. 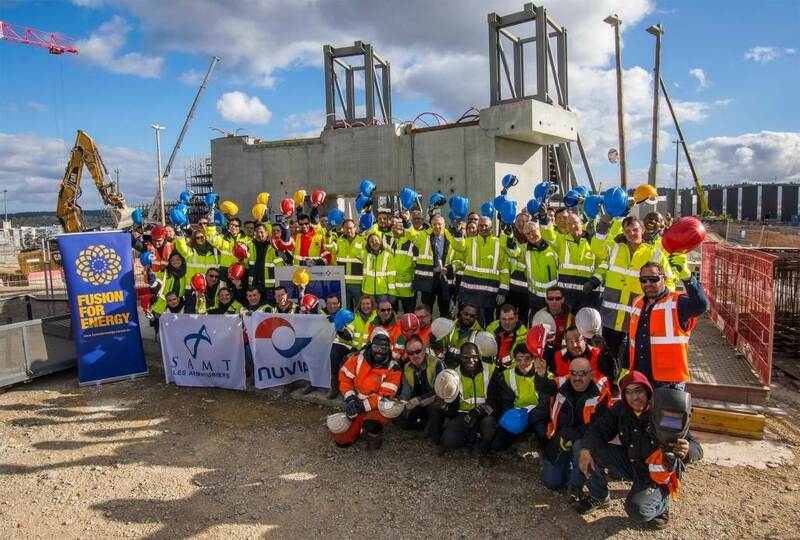 The event marks an important milestone for ITER, the European Domestic Agency F4E responsible for all building construction, and NUVIA, the company in charge of installing the seismic pads on the basemat of the Seismic Pit. 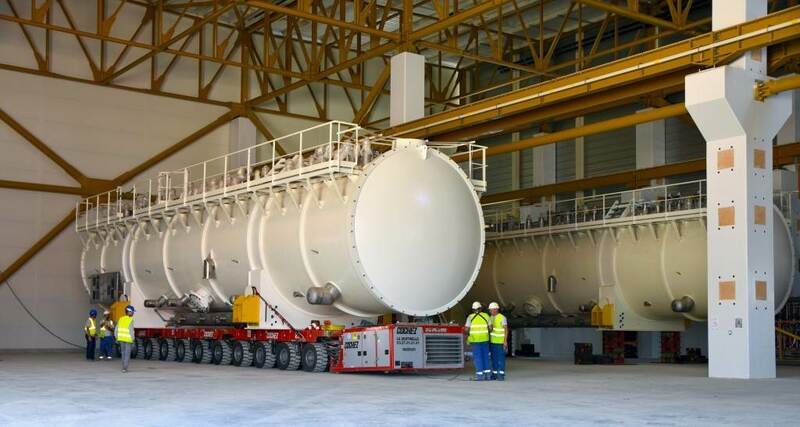 The handover of the completed Poloidal Field Coils Winding Facility takes place on 14 February 2012 between the building consortium Spie Batignolles/ Omega Concept/Setec and the European Domestic Agency Fusion for Energy, with representatives of the ITER Organization present. On top of 1.7-metre columns (493 in all), seismic bearings made of alternate layers of metal and rubber and installed. The three buildings of the Tokamak Complex will rest on a single foundation on top of these seismic bearings. 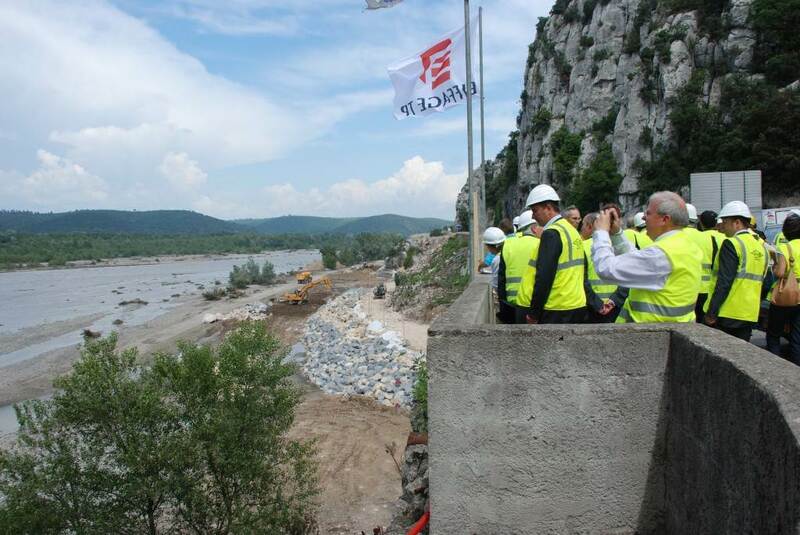 The Poloidal Field Coils Winding Facility is completed in January 2012 after 18 months of work. 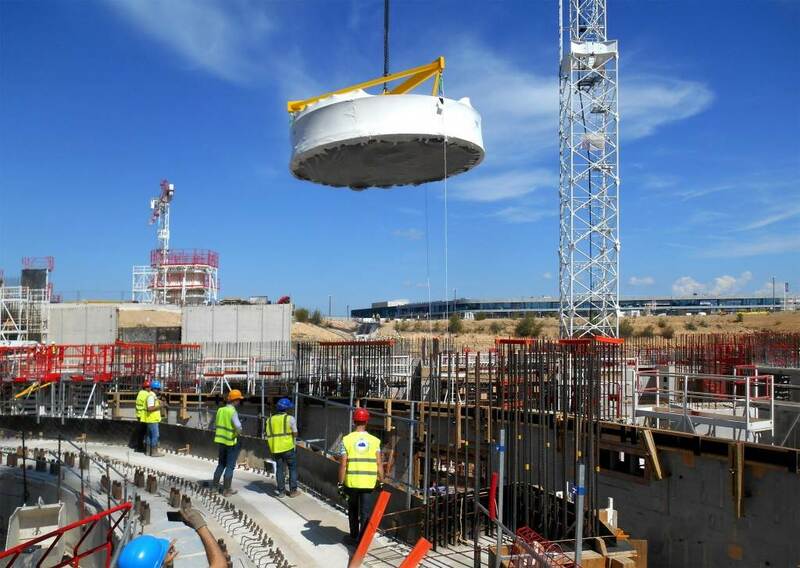 Here, the European Domestic Agency will wind five of ITER's six poloidal field coils—giant, circular magnets that will control the shape and stability of the plasma. 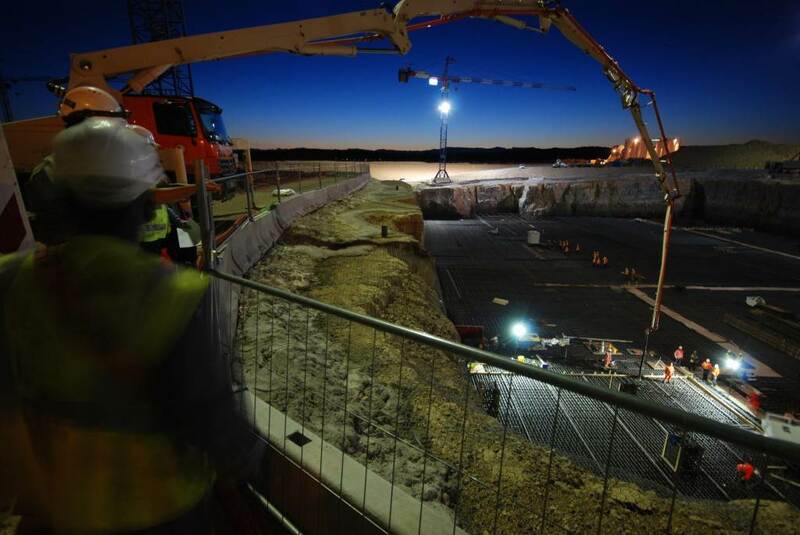 Concrete pouring begins before dawn on 9 August 2011. Over 500 holes are drilled into the Seismic Isolation Pit to examine the rock substrata. Any voids, or karsts, are filled with concrete. The Seismic Isolation Pit must be 17 metres deep, 130 metres long, and 90 metres wide. 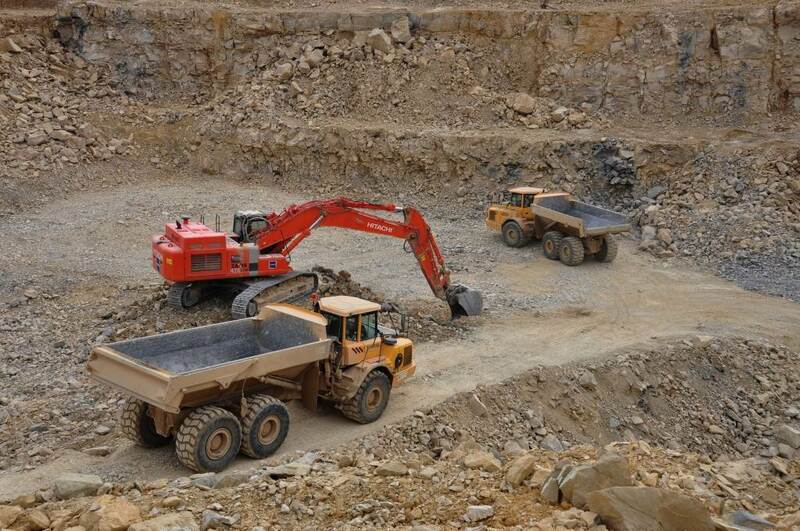 Some 210,000 cubic metres of rock and soil are removed during excavation works between September 2010 and February 2011. 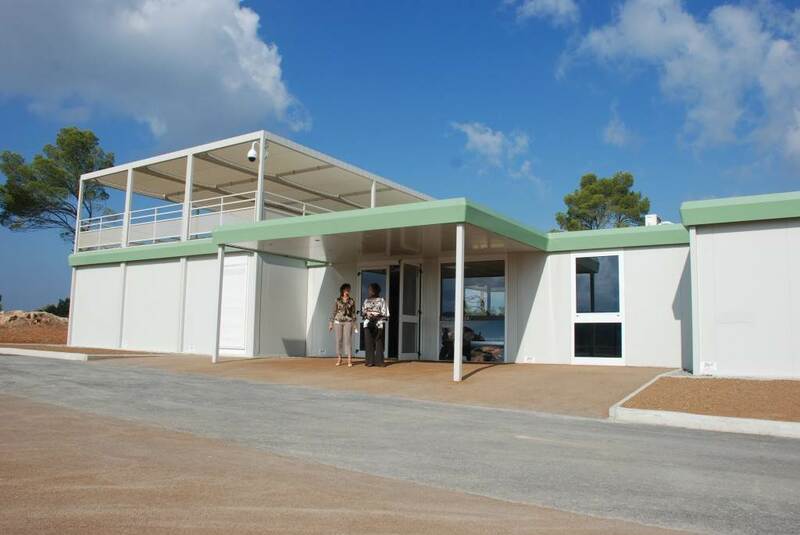 Ground work advances for the five-storey, 180 metre-long ITER Headquarters building. 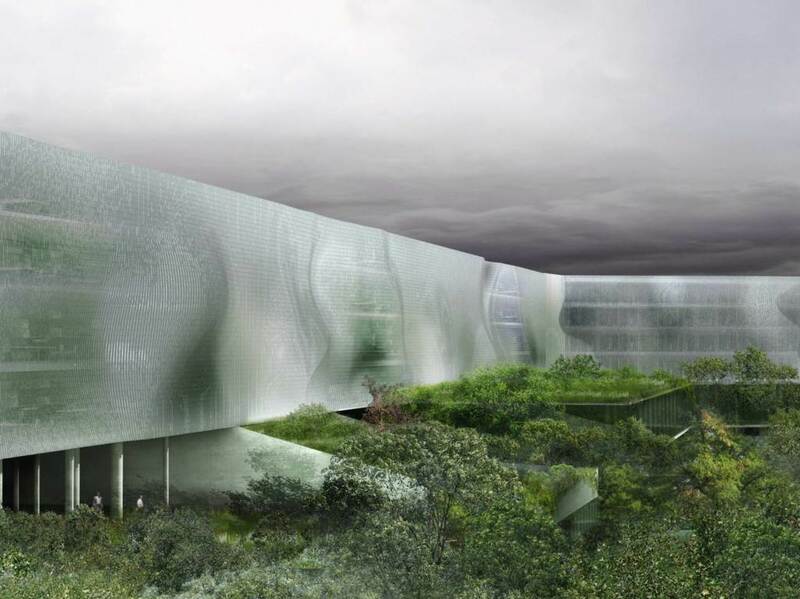 Construction of the 20,500 square-metre facility will require two years. 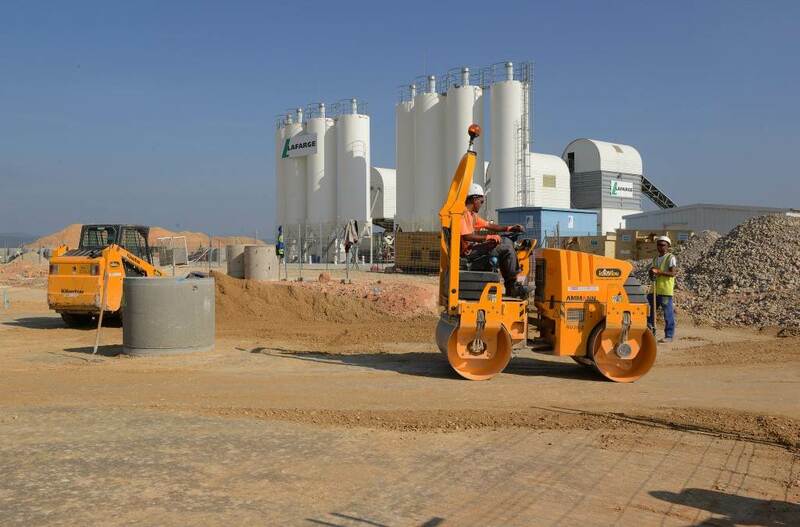 The first concrete slab is poured for the Poloidal Field Coils Winding Facility—the first scientific building to go up on the ITER platform. The facility will be needed to manufacture five of ITER's poloidal field coils that will be too large for transport once assembled. 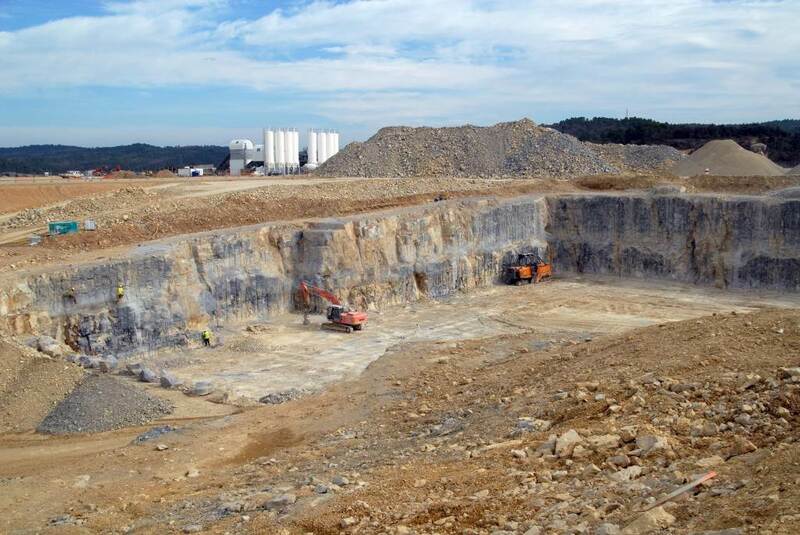 Digging begins in August 2010 for the future Tokamak Complex Seismic Isolation Pit. The European Domestic Agency F4E chooses a French consortium (Spie Batignolles, Omega Concept, Setec) to design and build the Poloidal Field Coils Winding Facility. Construction on the concrete and steel structure begins in August 2010. 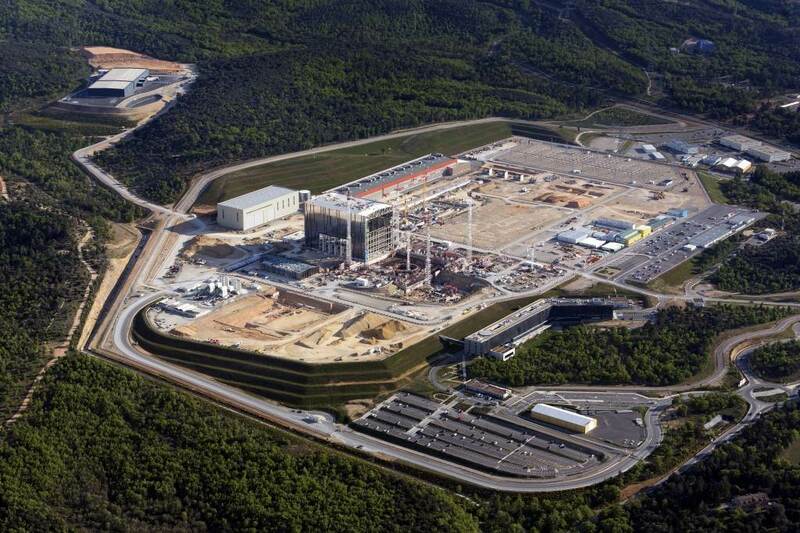 With preparatory work completed, the ITER platform now awaits construction. 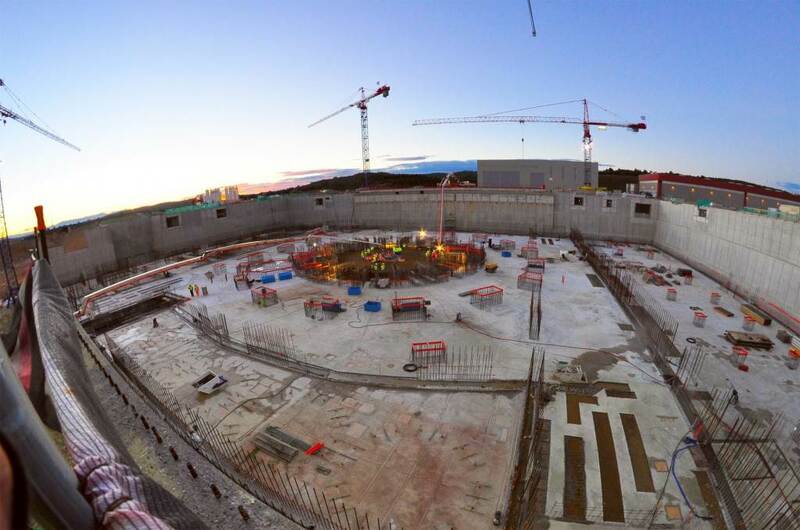 The ITER cooling basins will receive the cooling water from the Tokamak Complex for testing before its release into the Durance River. 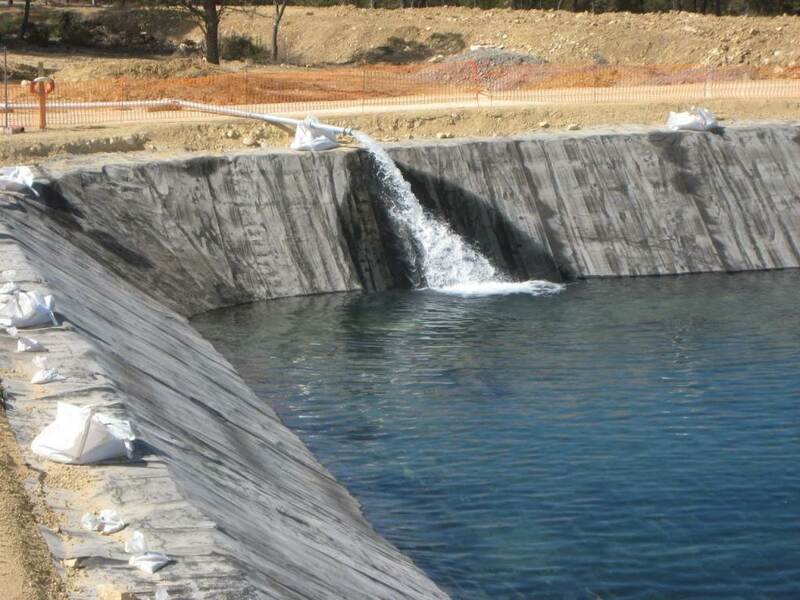 In March 2009, the completed basins undergo testing for leakage. 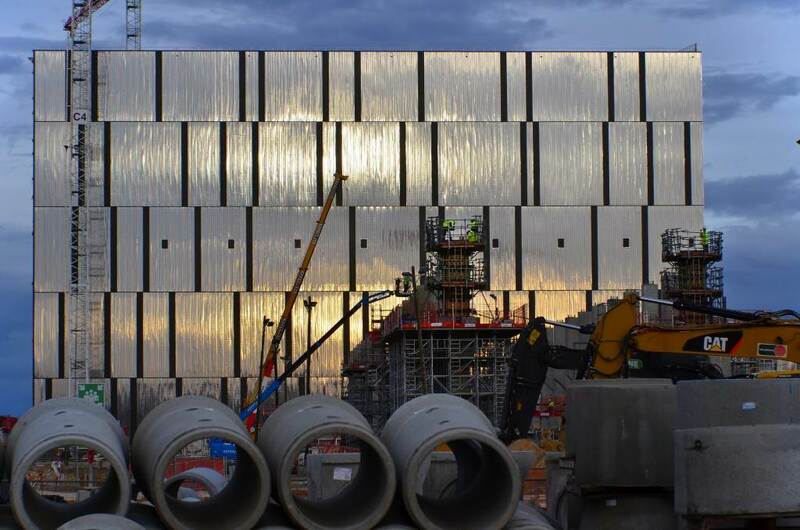 Offering an unbeatable view of the ITER platform, the new ITER Visitors Centre opens in September 2008. Information panels, mockups and a presentation room for 30 people are all geared toward informing the general public about the status and the stakes of the ITER Project. 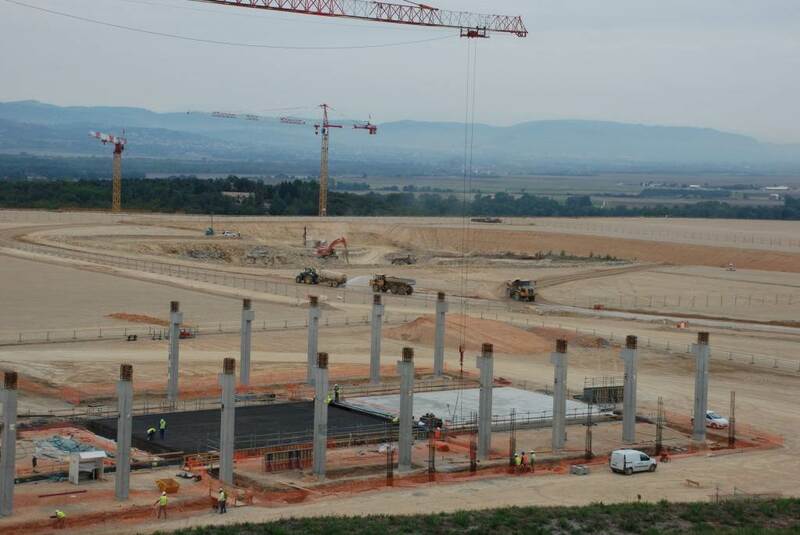 Work on the ITER Itinerary comes to an end in December 2010. 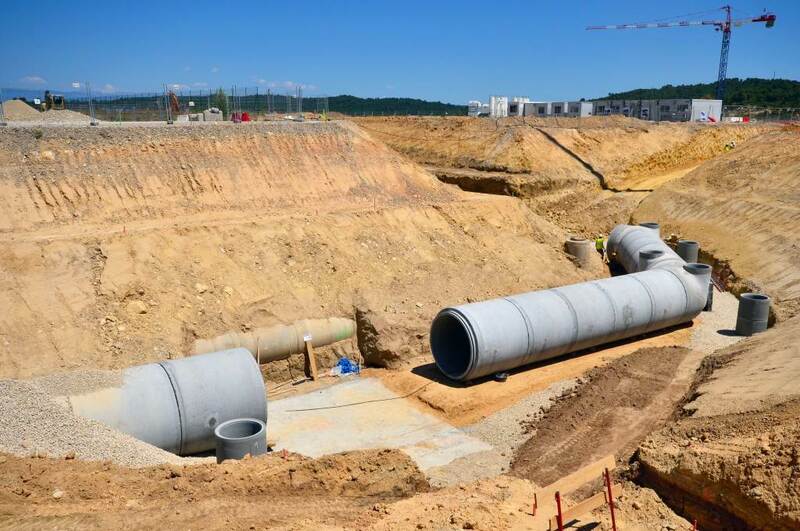 Large-scale public works were carried out along the 104-kilometre Itinerary by France as Host state between 2008 and 2011 to widen roads, reinforce bridges and modify intersections in preparation for the exceptional size and weight of some of the Tokamak components. 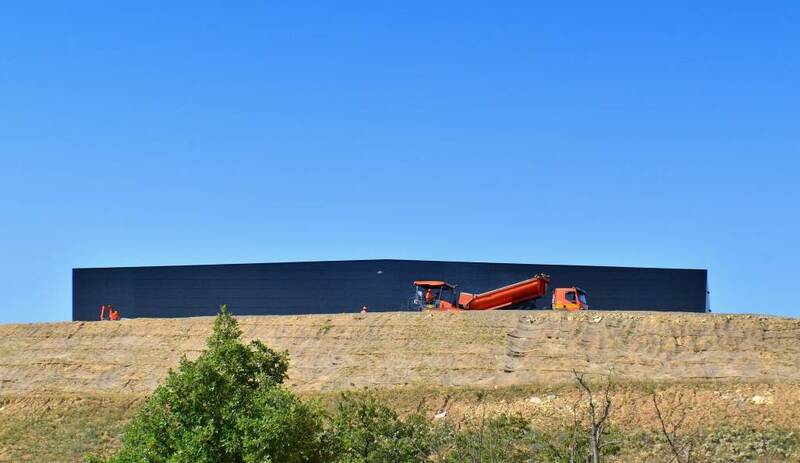 The cost for these road works (EUR 110 million) was shared by the Bouches-du-Rhône department Council (66 percent) and the French State (34 percent). 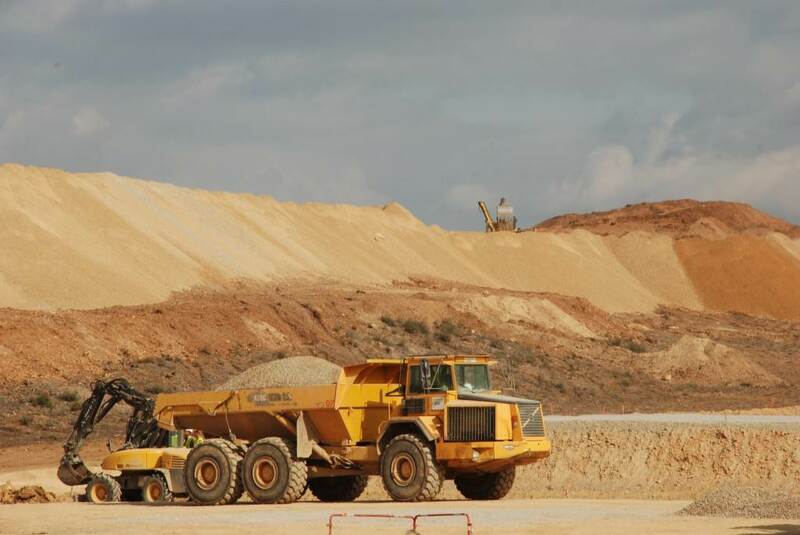 To create a level platform at 315 m, workers removed 2.5 million cubic metres of earth and rubble—an amount equivalent in volume to the Kheops Pyramid in Egypt. 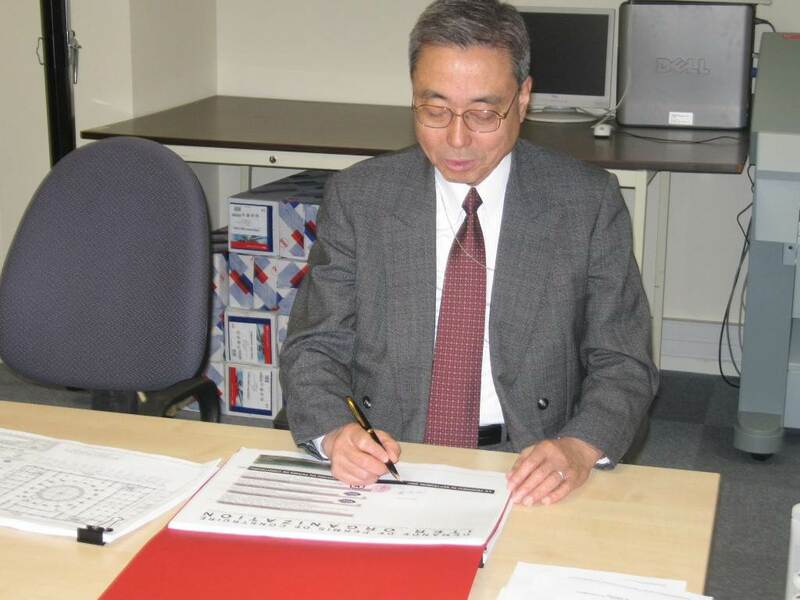 Director-General Kaname Ikeda signs additional documentation for the ITER Organization's building permit request, which had initially been submitted at the end of September 2007. These documents, once submitted to the mayor of Saint-Paul-lez-Durance, will be thoroughly reviewed by the French administration. 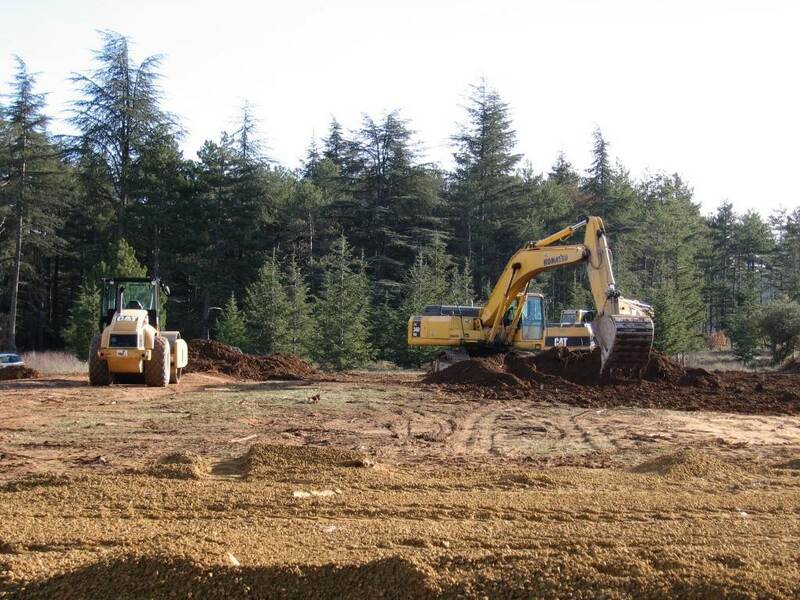 About 90 hectares were cleared for the project, leaving half of the 180 hectare parcel set out for ITER in its original wooded state. This first phase of work took over one year to compete. 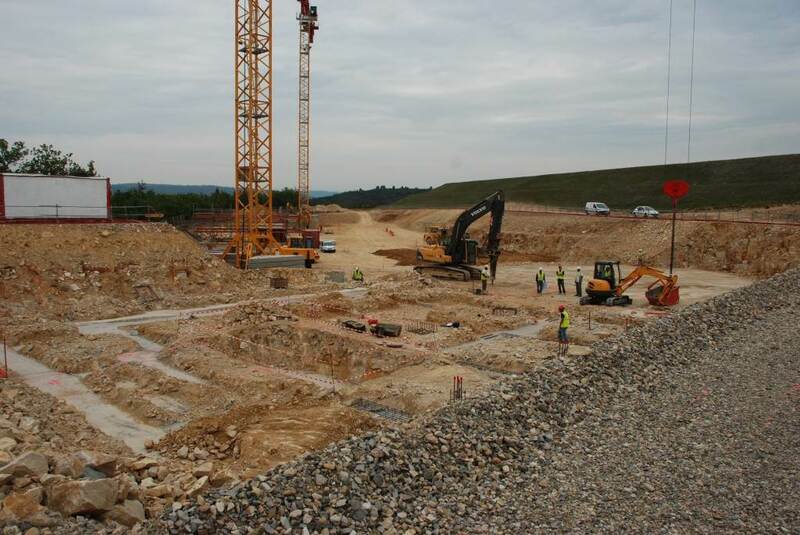 The ITER site in early 2007, as site works begin. 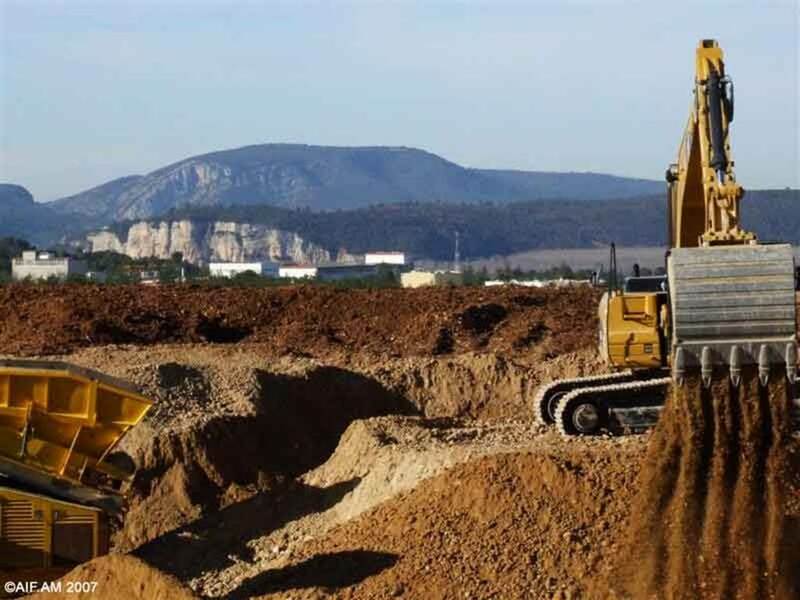 Before the diggers move in, measures are taken on the ITER site for the protection of fauna and flora, in collaboration with the regional environment authorities. 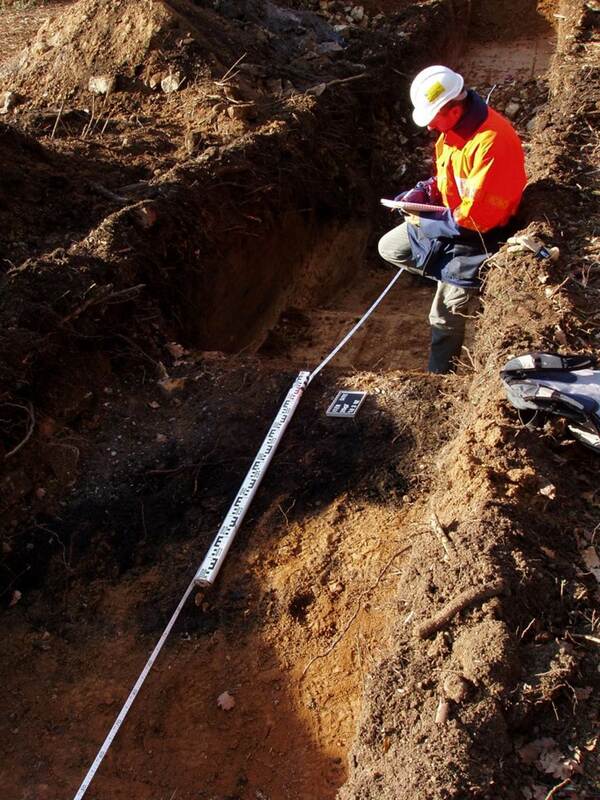 An archaeological survey is required by the French law preliminary to any large construction project. At ITER, archaeologists from the French Institute INRAP revealed several traces of the past: a lime kiln, a charcoal oven and remnants of a glass factory from the 18th century, and several tombs dating from the 5th century A.D.
Site preparatory works are undertaken by Agence Iter France from 2007 to 2009 as part of commitments made by France and Europe as hosts to the project. 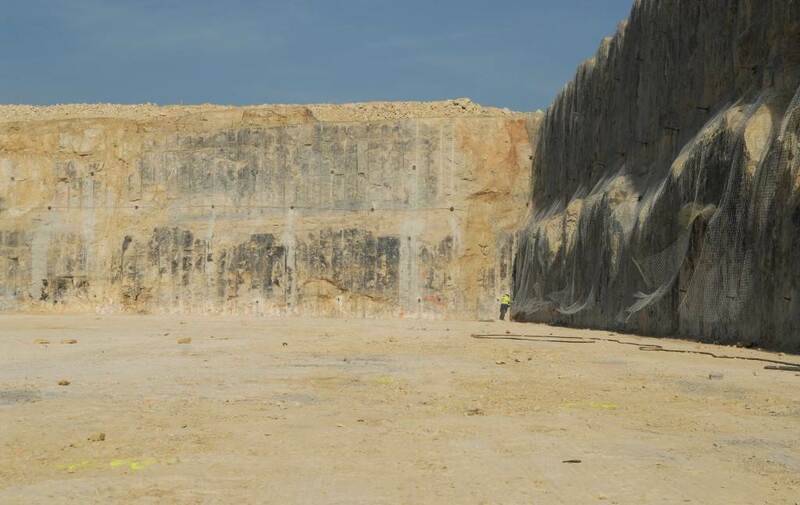 Site work is divided into two main phases: the clearing of 90 hectares, and the levelling of a vast platform to house the buildings and facilities of the ITER scientific experiments.